Development — this abbreviated, important section precedes discussion of adult anatomy. A more complete discussion is found in the dedicated section of neurovascular embryology. The basic arrangement of the spinal system consists of a metameric grid of trasversely oriented segmental vessels, connected by various longitudinal channels. This simple bit of knowledge goes a long way in understanding spinal anatomy. Millions of years of speciation have taken place upon a basic building block of the organism — the metameric segment. Just like the fly and the worm, the human body consists of metameric segments, with ecto-, meso-, and endodermal elements. Each vertebral body, its ribs, muscle, nerves, and dermatome, correspond to one level or segment. It is perhaps easiest to appreciate this concept at the thoracic level, where each rib, vertebral body, and other elements constitute the prototyical segment. In the early human embryo, the neural tube is first supplied by simple diffusion. When its limits are reached (200 micrometers perhaps), a primitive vascular system consisting of paired dorsal and ventral aortae (longitudinal vessels) and transversely oriented segmental arteries come into play to vascularize the developing tissue of the embryo. As the tissue of spinal cord continues to enlarge, new longitudinal connections form between the transverse segmental arteries, most likely to facilitate distribution of blood within the vascular system. This pattern is seen throughout the body, but is somewhat easier to recognize in the vertebrospinal arterial system, where it gives rise to adult anterior spinal artery and numerous extradural longitudinal segmental connections which will be discussed below. 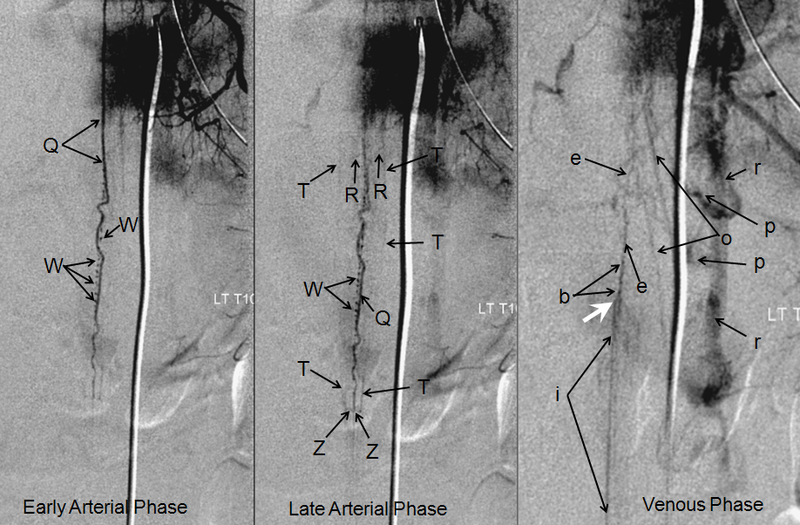 Gradual establishment of dominant longitudinal vessels leads to regression of most transverse segmental arteries, except at some levels where such vessels persist in supplying the longitudinal artery. This process, in terms of the spinal cord, gives rise to the familiar adult appearance of the anterior spinal artery and its remaining radiculomedullary feeders, while most segmental arteries previously connected to it in early fetal life are limited to supply of the nerve root and adjacent tissues in the adult. The same pattern of development takes place in the extra-axial, paravertebral space, where longitudinal connections between segmental arteries form a multitude of adult vessels, such as the vertebral, pre-vertebral, pre-transverse, deep cervical, lateral spinal, and other arteries, as will be illustrated below. The basic arterial vertebrospinal vascular unit consists of two segmental vessels, left and right, arising from the dorsal surface of the aorta. The vessel curves posterolaterally in front of the vertebral body, and sends small branches into its marrow. In front of the transverse process, the segmental artery bifurcates into a dorsal branch and an intrercostal branch. The intercostal segment supplies the rib and adjacent muscle and other tissues. The dorsal branch feeds the posterior elements and, via the neural foramen, sends branches to supply the local epidural and dural elements, as well as a radicular artery to nourish the nerve root. 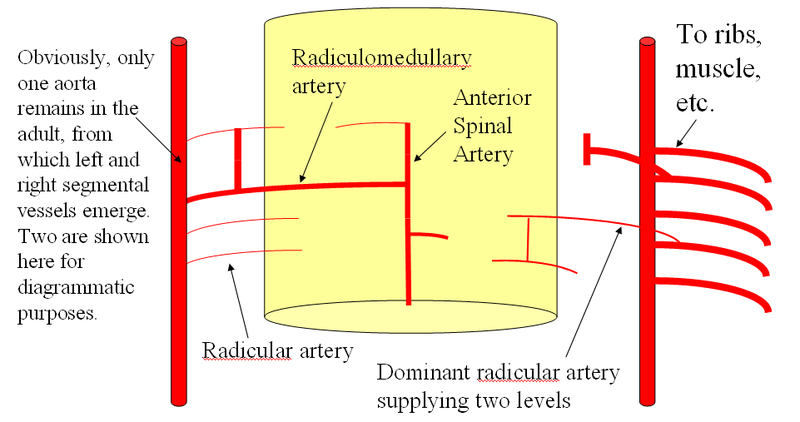 At some levels, the radicular artery is enlarged because, instead of supplying local neural elements, it maintained its embryonic access to the anterior spinal artery. At this level, the artery is called “radiculomedullary” because it also supplies a large segment of the spinal cord. Various other arrangements are seen, for example when radicular artery supplies portions of the dorsal spinal cord, a discontinuous network which is often misrepresented in venerable anatomical texts as a continuous system of two posterior spinal arteries. This is the basic arrangement of spinal supply. The system varies in the cervical, upper thoracic, and sacral segments (i.e. exceptions are greater than the rule) but the basic principle of segmental dural and radicular vessels supplying neural tube elements is a very useful guide. Variation comes chiefly in form of segmental vessel origin — whereas descending aorta serves this puprose for most thoracic and lumbar segments, the vertebral artery, subclavian branches (costocervical trunk for example), supreme intercostal artery, and median sacral artery (effectively a diminuitive continuation of the aorta below the iliac bifurcation) play this role at the appropriate segments. 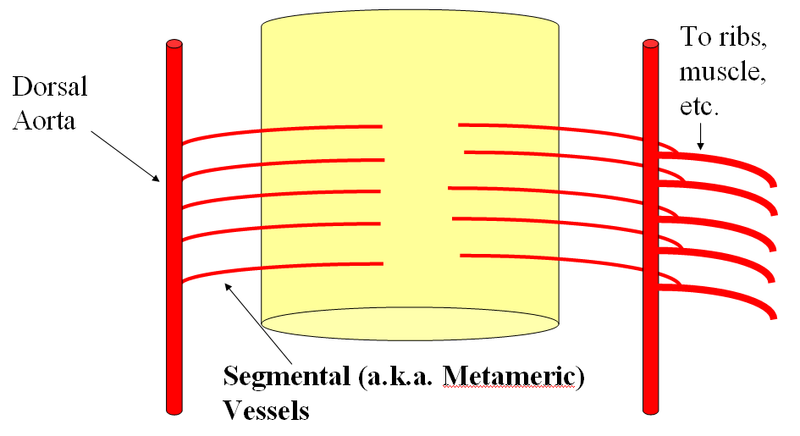 These vessels of origin are part of the gridline of longitudinal channels which form to connect embryonic segmental vessels. For example, the vertebral artery represents a confluence of discontinuous embryonic channels termed the “longitudinal neural system” into a single trunk. This, in part, explains multiple variations and duplications encountered in the vertebral territory. 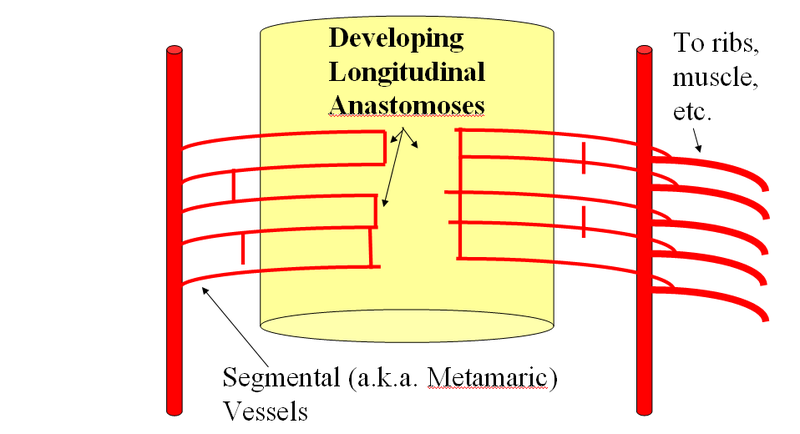 Figure 1: Somatotopic organization of the vertebrospinal arterial vasculature, highlighting segmental vascular organization of the vertebrospinal axis and homologous longitudinal anastomoses along its entire length. As you can see, numerous longitudinal vessels exist throughout the vertebrospinal axis, often with the same vessel going by several different names, for historical reasons. For example, see above for homology between the lateral spinal, pre-transverse, and deep cervical arteries. The segmental arrangement is particularly modified in the cervical region, where longitudinal vessels are dominant — most obviously the vertebral arteries. 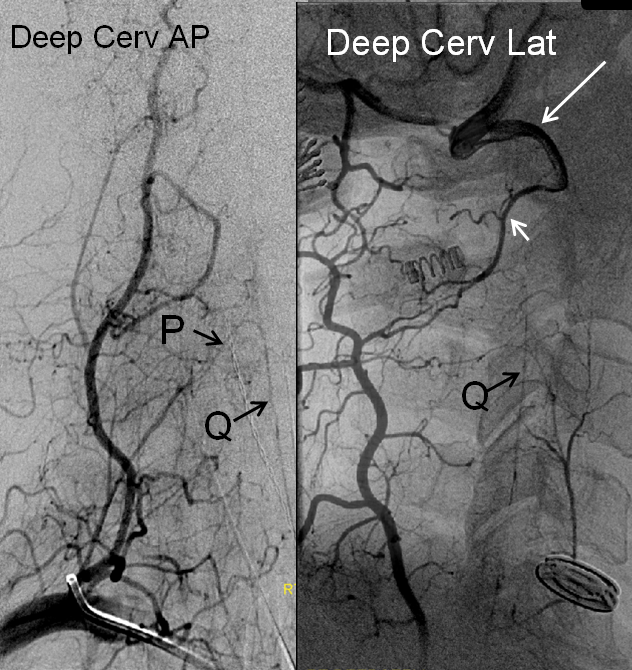 It is important however to recognize the existence of segmental vessels connecting the three dominant cervical longitudinal arteries (ascending cervical, vertebral, and deep cervical) in terms of their anastomotic potential and its implications for both collateral revascularization and inadvertent embolization during interventional procedures. 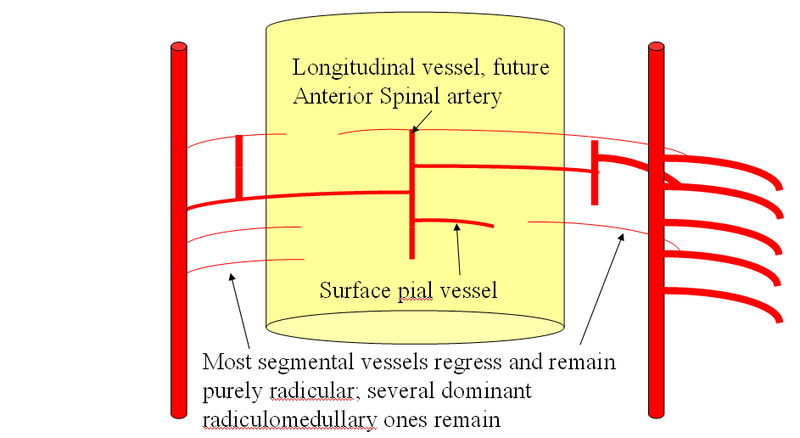 The following diagrams provide a basic view of relevant arterial anatomy of the spinal elements, serving as a guide for interpretation of subsequent catheter angiography illustrations. In the following examples, nomenclature using the above letters will be used for correlation. Aorta and segmental vessels. Many spinal angiograms start with imaging the biggest vessel in the body. 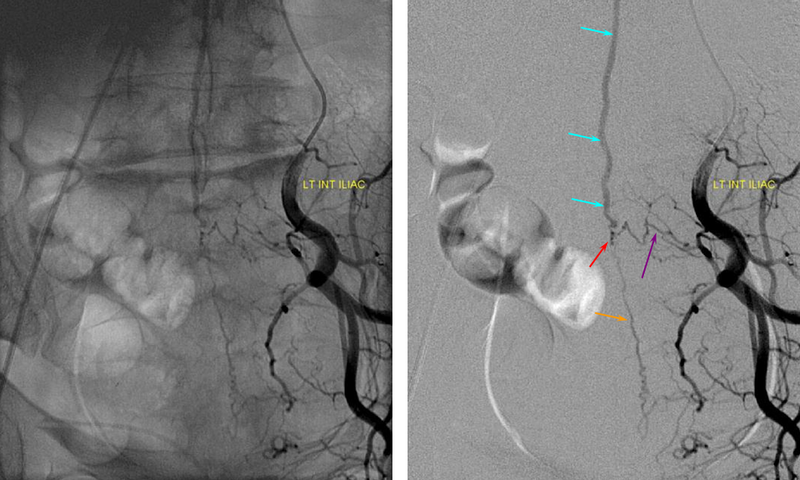 Some are surprised to discover that these segmental lumbar and intercostal arteries (red) are actually not that small (between 1 and 2 mm diameter typically) — most can be easily engaged (and occluded) with a 5F catheter. 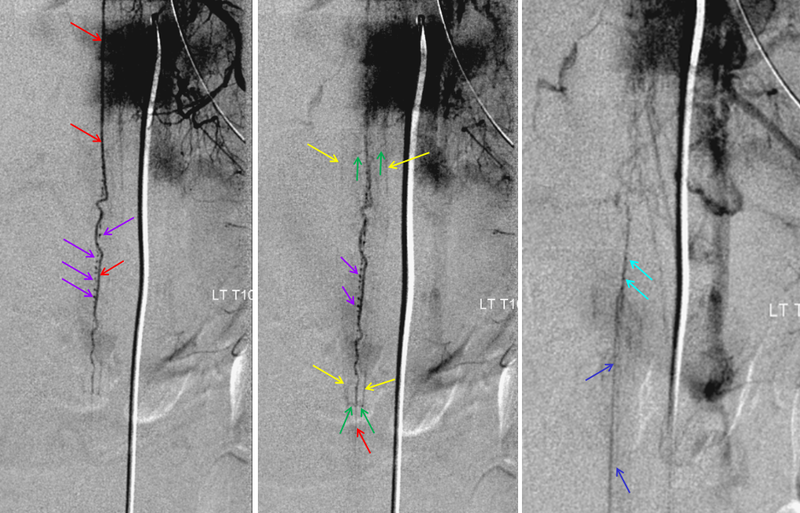 The aortic injection gives a roadmap, may identify a particularly large fistula, and show which levels may have missing segmental arteries, thereby obviating a frustrating search. 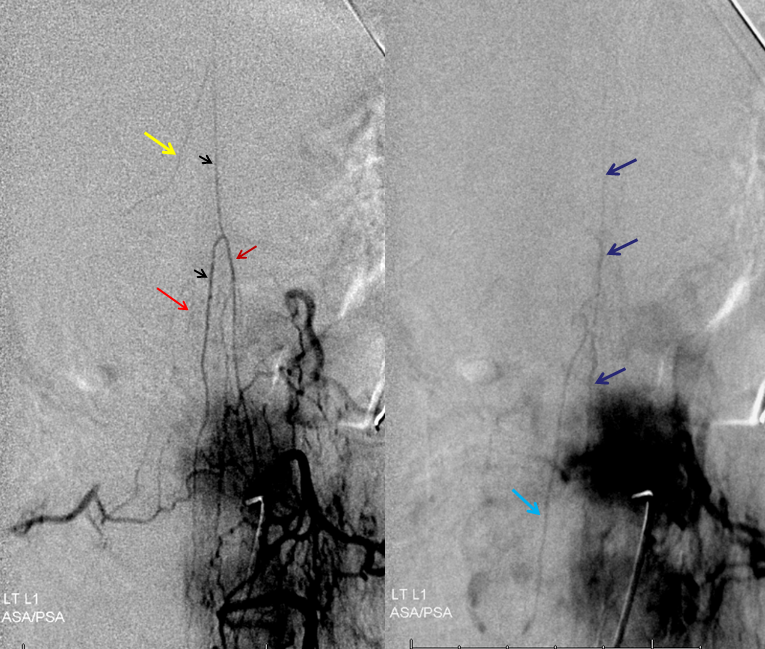 In this angiogram of a patient with a dural fistula, a congested spinal cord vein (light blue) can be seen in the venous phase (dark blue). 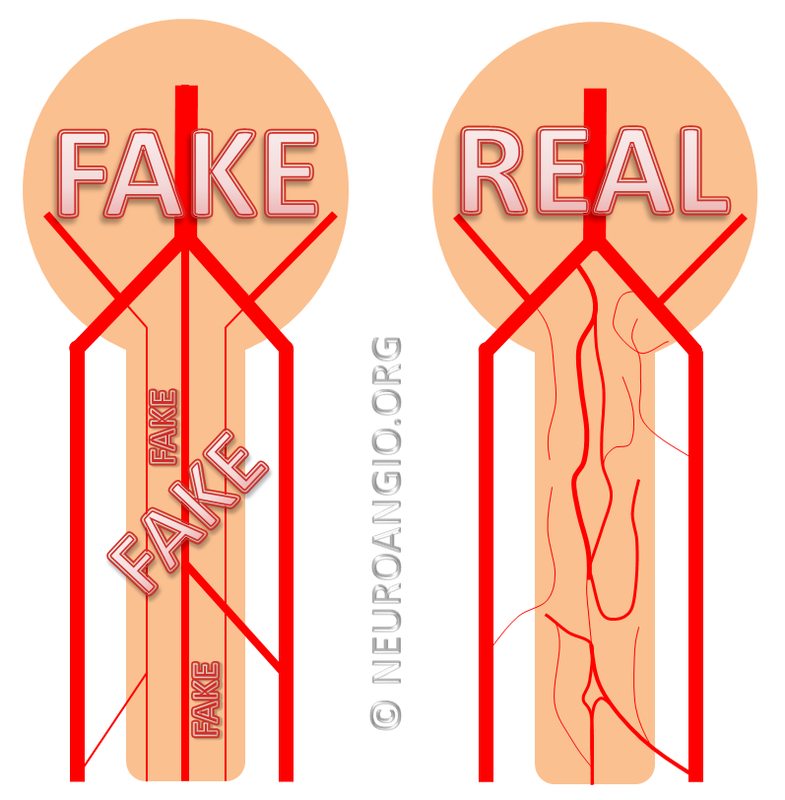 Celiac trunk (orange) and renal arteries (yellow) are also labeled. Typical Lumbar artery (segmental artery) injection. During spinal angiography, the segmental artery is selected with an appropriate 4F or 5F catheter (RDC, SAS). Injection rates are 1-2 cc/sec for as long as you think you need it, typically 2-4 seconds. Frame rates vary from 1-3 per second, and should not exceed 3 unless particularly necessary (to visualize microanatomy of a high flow fistula, for example). When dural or other fistula is suspected, multiple levels may need to be interrogated. One can easily go through 300 ml or more of contrast, so be aware. For metastatic disease, the search may be more focused. 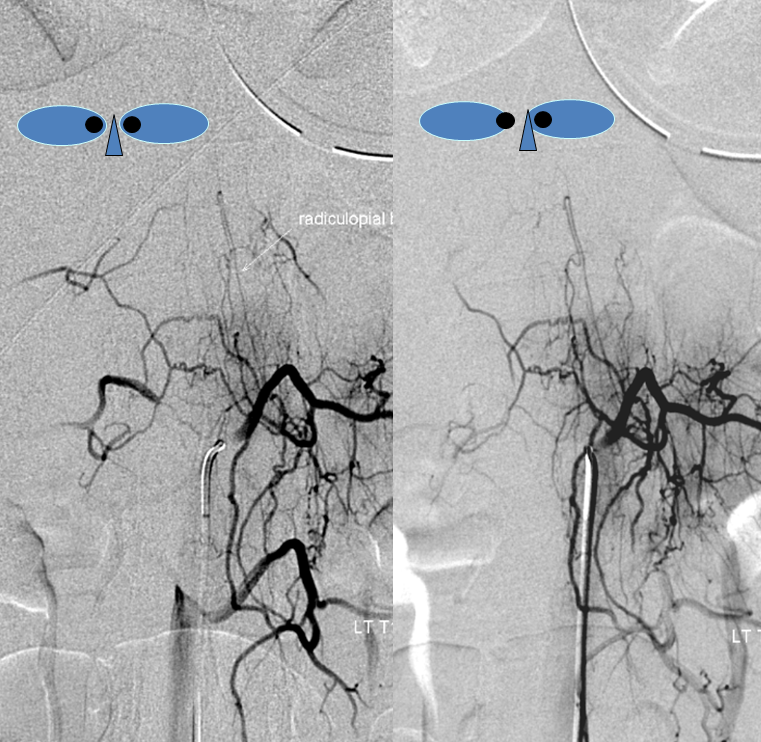 It is helpful to view the angiogram in both subtracted and native views to appreciate both fine vascular detail and bony landmarks. The lumbar artery (purple, B) is relatively selectively injected, with trace opacification of hte contralateral left L3 lumbar artery due to proximity of the left and right orifices to each other. Since there is no rib, the artery does not have a prominent “intercostal” component. 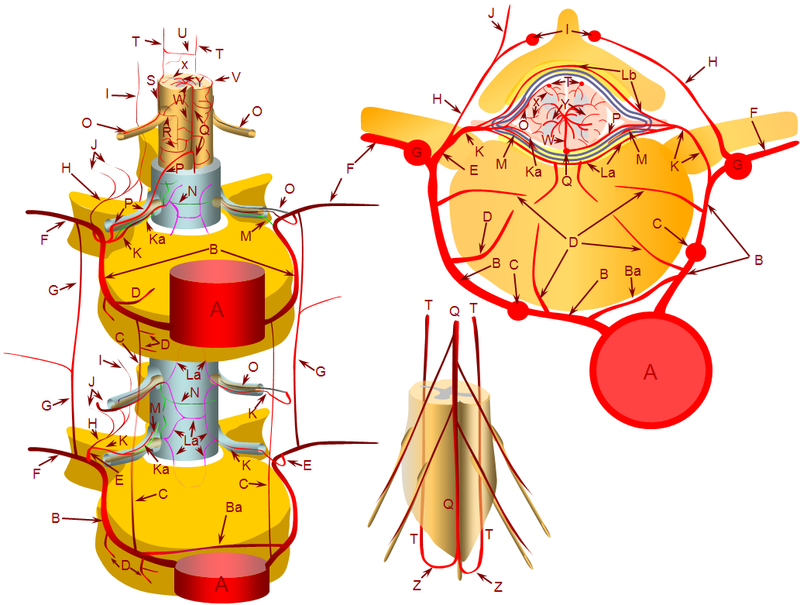 The arteries of the dorsal branch (red, H, J) supply the lamina and adjacent tissues, with anastomosis to the spinal process arterial arcade (yellow, I). You can see continuation of this arcade inferiorly, NOT to be mistaken for the anterior spinal artery or other spinal artery. The anterior spinal artery is straighter and has a characteristic radiculomedullary hairpin turn (see below). A large paravertebral anastomotic branch (green, G) is present, which opacifes ipsilateral L4 level dorsal branches (blue, H, J). 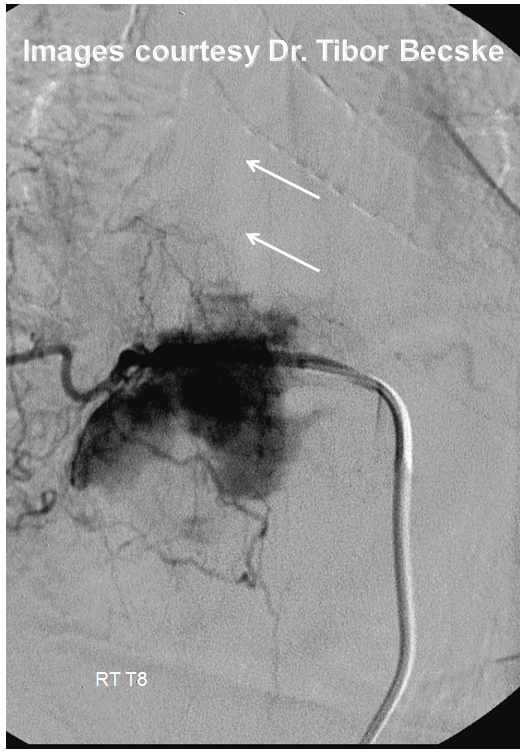 No radiculomedullary artery is seen at this level. Common lumbar trunk: Especially in the lower spine, single left and right lumbar artery origins are common. Absent levels are also common, usually supplied via paravertebral and prevertebral anasomoses. 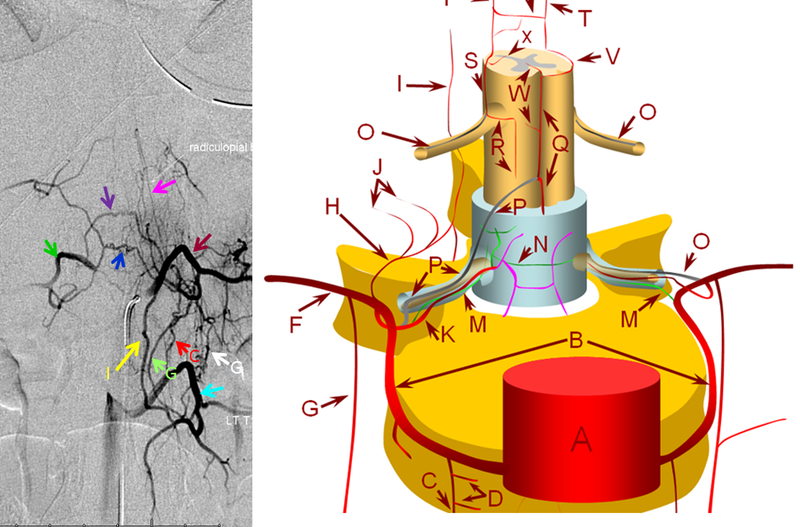 Paravertebral anastomotic network — typically, this is the dominant longitudinal anastomotic connection between adjacent segmental arteries. It is particularly well visualized in young, normotensive patients. 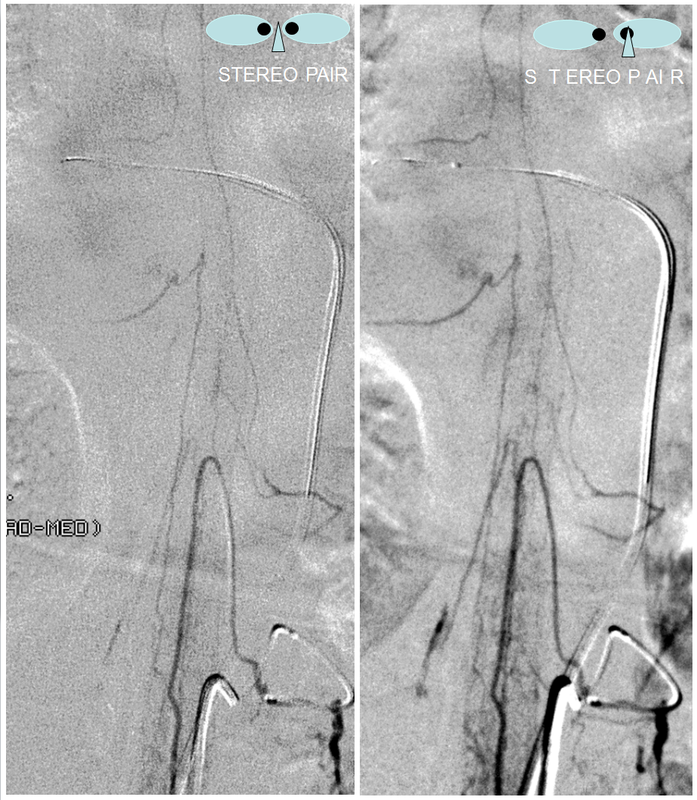 Technical considerations are also important — having the catheter well-wedged into the ostium of the segmental artery, as well as longer, higher volume injections (within reason, of course), are key to opacifying all kinds of collaterals. The paravertebral network is located along the lateral aspect of the vertebral body, adjacent to the sympathetic chain, for example. A well developed paravertebral network (blue, G) is present. 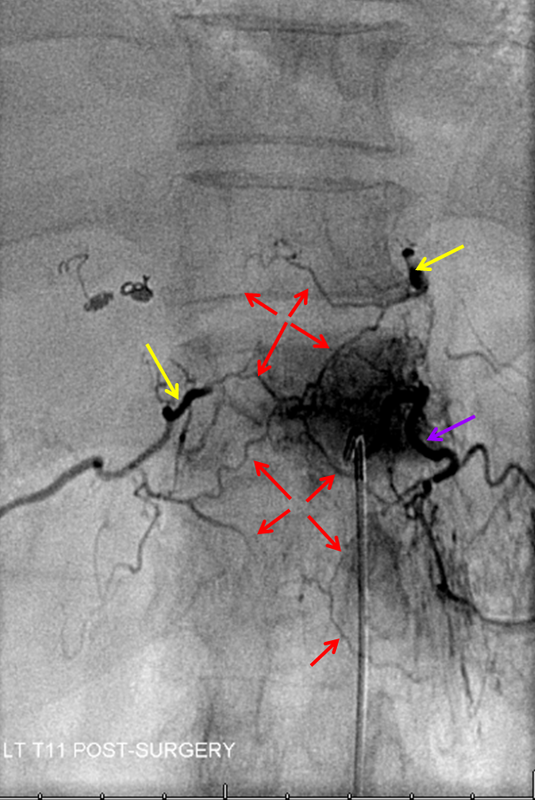 The catheter (red) is engaged in a lumbar artery (brown, B) and via this network opacifies the lumbar artery of the level immediately above (purple) and immediately below (pink). Notice the spinous process arcade again (black, I). 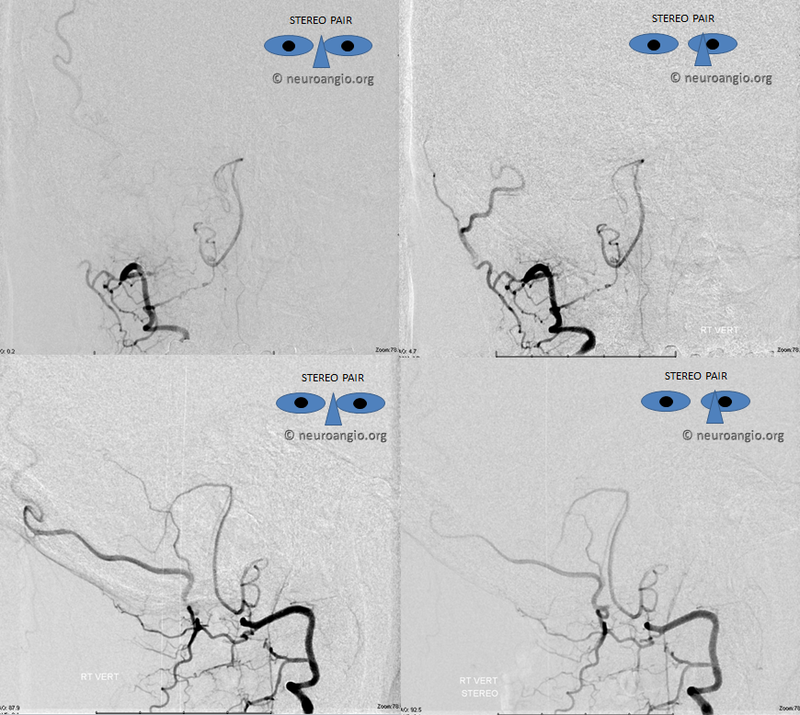 This network ensures virtual impunity for atherosclerotic or iatrogenic occlusion of a proximal segmental artery. More care should be excercised at radiculomedullary artery levels. 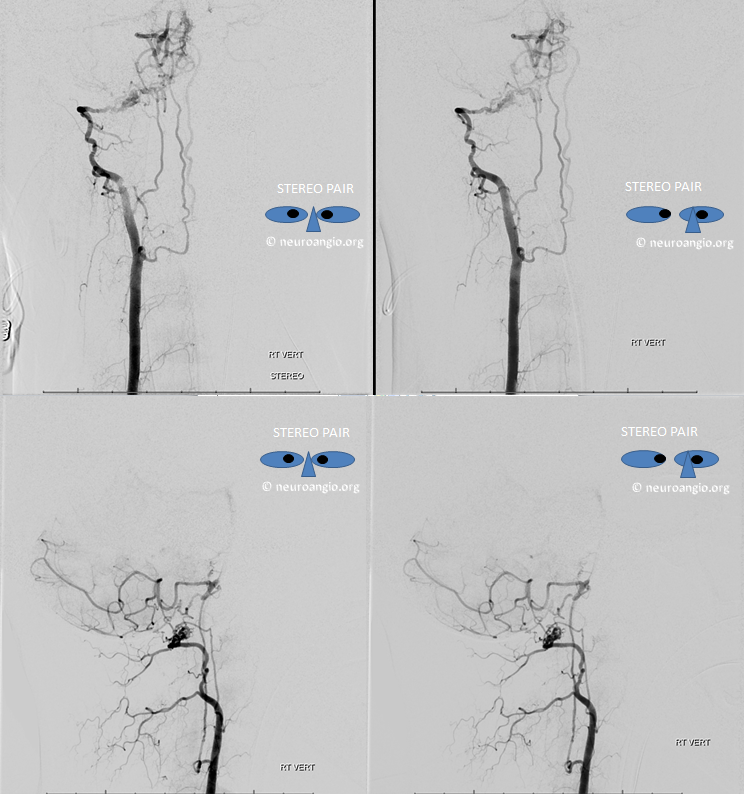 In this patient, all three networks are demonstrated — stereoscopy is very helpful to decide which is which. Also notice prevertebral transverse and retrocorporeal networks at same level. C – prevertebral anastomotic network; G – paravertebral anastomotic network (can opacify adjacent levels with strong injection, or supply adjacent level in case of intercostal artery hypoplasia/aquired stenosis); I – spinous process branch and associated anastomotic network connecting spinous processes; Blue — precorporeal anastomotic network (not shown in diagram); blue — retrocorporeal anastomotic network (pink color vessels in diagram, and see section below); light blue — left L1 segmental artery; brown – left T12 segmental artery; dark green — right T12 segmental artery; pink – radiculopial artery. 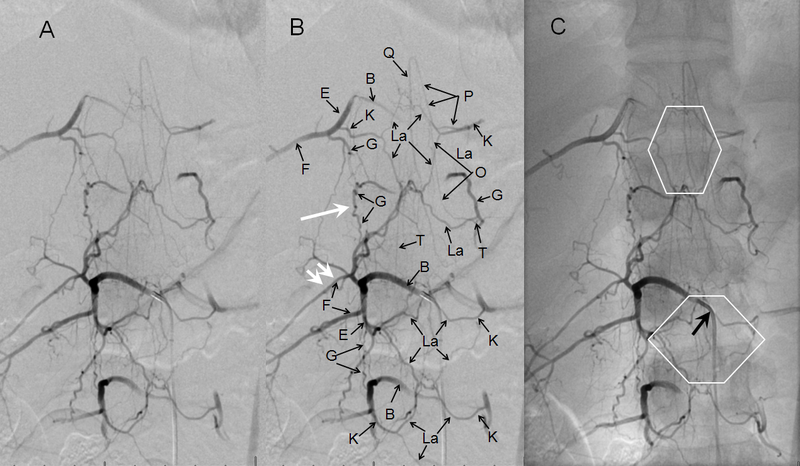 Lumbar segmental artery injection, demonstrating a well-developed post-transverse anastomotic network (I) visualized through the ventral division (H) of the segmental artery (B), with its muscular branches (J), as well as the pre-transverse anastomosis (G), both contributing to collateral visualization of the adjacent cranial segmental artery (B). F – muscular artery, homolog of the intercostal artery. This characteristic diamond-shaped network behind the vertebral body (in the epidural space dorsal to the posterior vertebral body cortex, also known as anterior [with respect to the spinal cord] epidural space) marked with “L” on the diagrams above, constitutes the primary anastomotic connection between left and right segmental arteries of the same level. Like everything, else it is variable in prominence based on developmental and other considerations. A good injection can usually opacify parts of the network, but it becomes quite obvious once the diamond-shaped configuration corresponding to left and right superior and inferior contributors to the diamond are revealed. 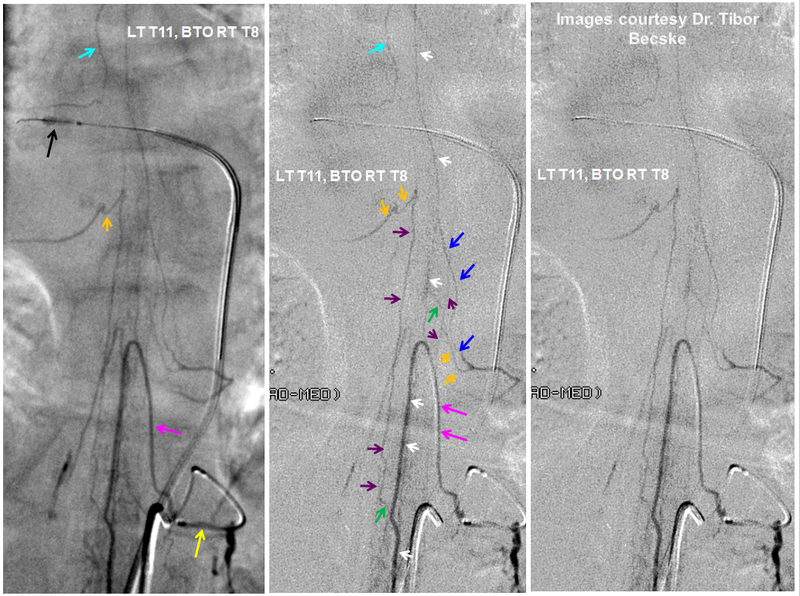 One way to improve visualization of the network is via an injection adjacent to a dissected segmental artery. 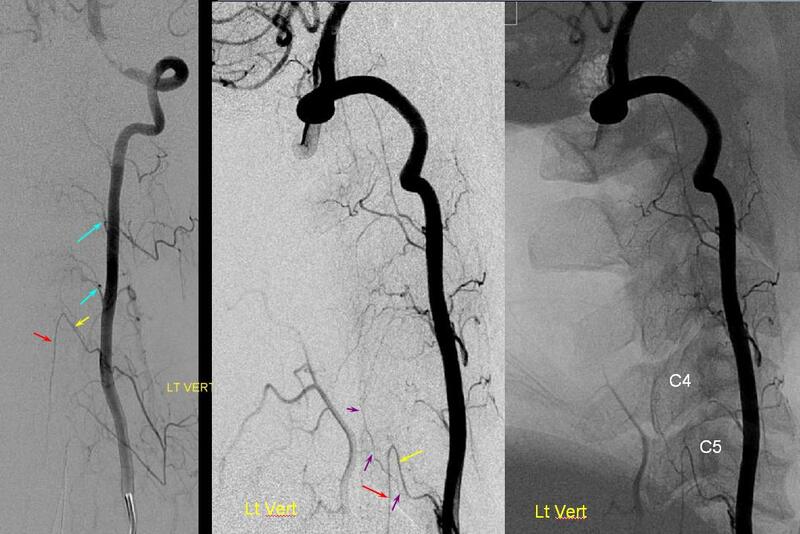 T12 segmental artery injection of a young, normotensive slender patient, providing exquisite visualization of the various trans-segmental anastomoses, demonstrating a hexagon-shaped multilevel anterior epidural arcade (La), and prevertebral anastomoses (G). Notice developmental hypoplasia of the right T11 segmental artery (single white arrow, one level above the catheter), with a corresponding small intercostal artery caudal to its normal position (double white arrow). Both radiculomedullary (P) and radiculopial (O) arteries are present, the former demonstrating its characteristic midline course. 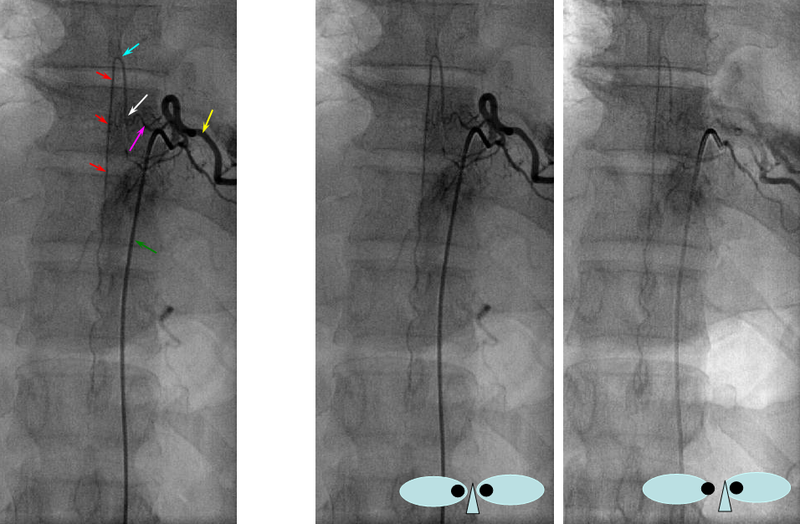 The median sacral artery — continuation of the aorta, the median sacral artery usually comes off the carotid bifurcation, and can be most easily engaged via some kind of recurved catheter (It is the artery to the tail of countless species which happen to have one). As a homolog of the aorta, it gives origin to segmental vessels of the sacrum. 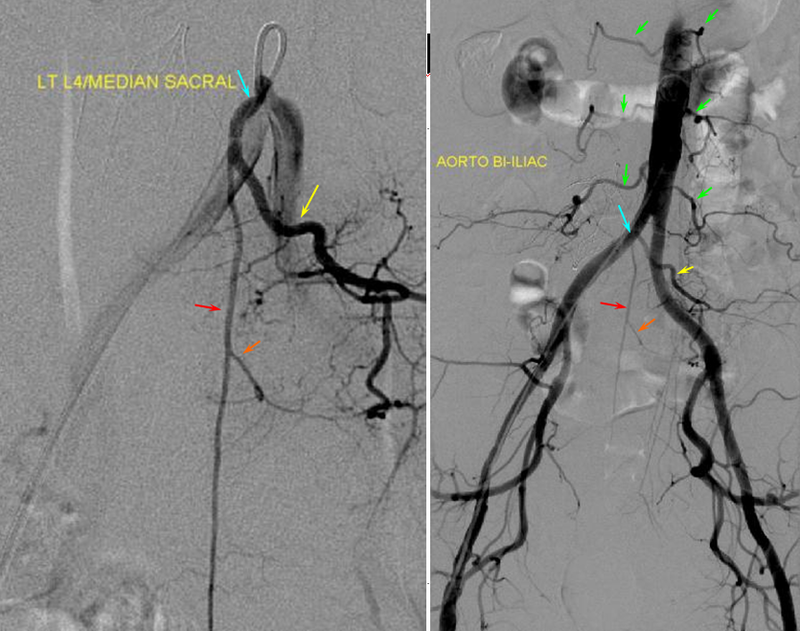 Thus median sacral artery injection is in fact a sacral aortogram — opacifying multiple segmental sacral branches. It is a must see artery when looking for a fistula. 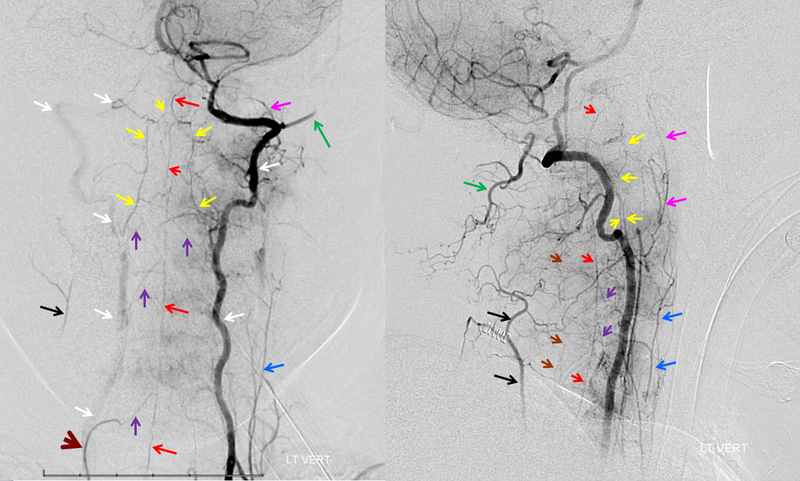 Here, the median sacral artery (red) originates from the left L4 branch (blue and yellow). Lumbar segmental vessels seen on the aortogram are shown in green. 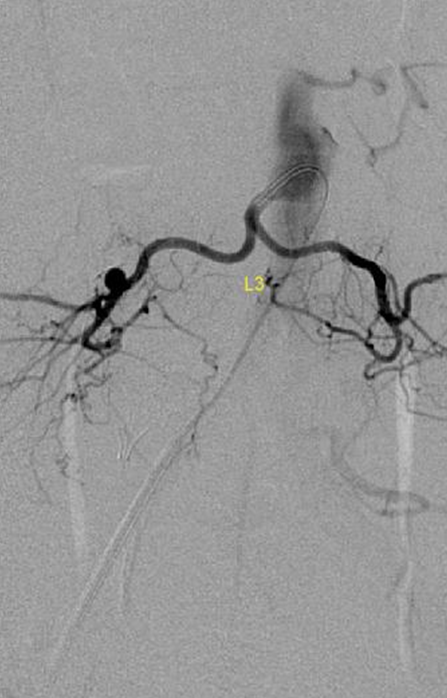 In this example, median sacral artery arises from a common L5 trunk. 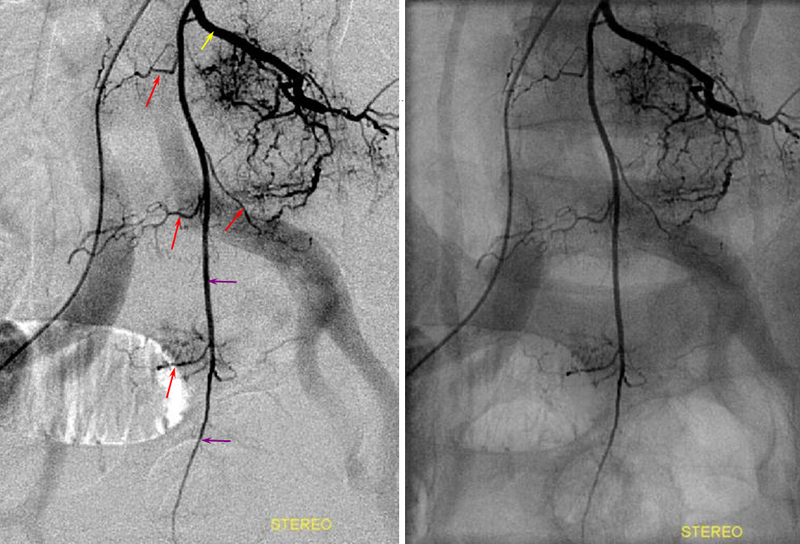 Below the aortic bifurcation, segmental arteries can be visualized by injection of the median sacral artery (above) and internal iliac arteries, via the lateral sacral artery (see figure 1 above) The importance of iliac artery investigation cannot be overstated. 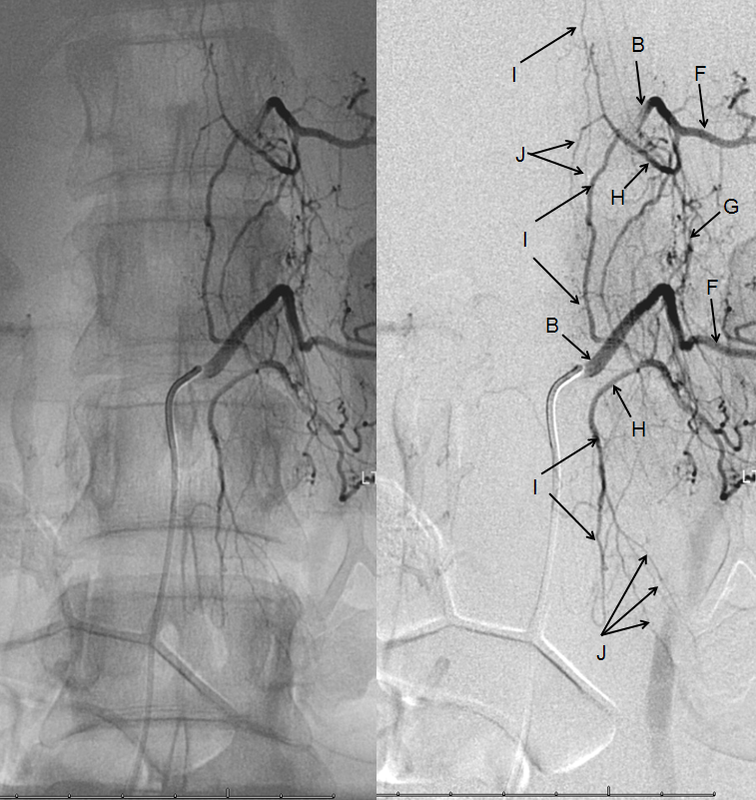 The patient whose images are shown below underwent two spinal angiograms for investigation of suspected dural fistula, based on classic MRI appearance of cord congestion and serpiginous vessels in setting of progressive neurologic decline. 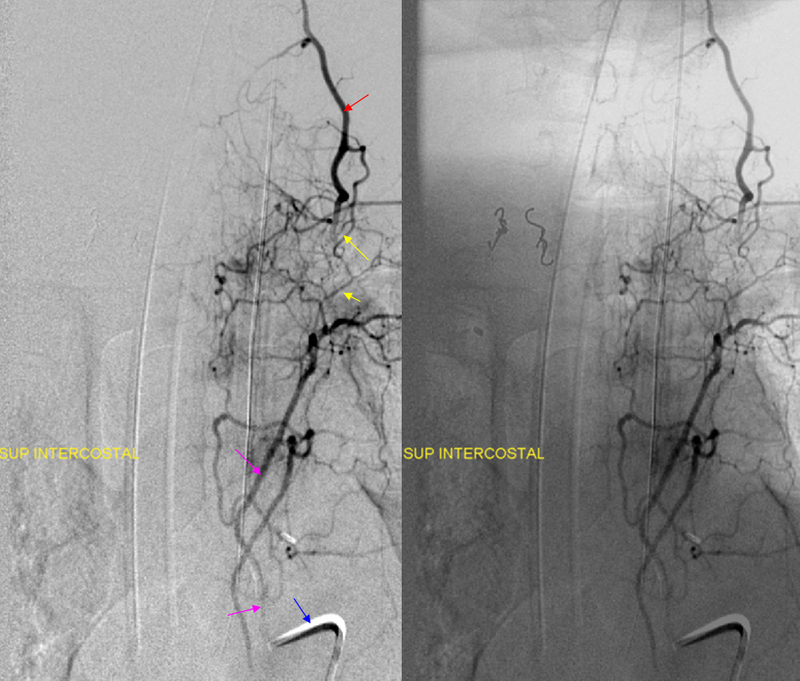 Only on third time around was the left internal iliac artery interrogated, easily disclosing a dural fistula, supplied by a segmental artery (purple) and collateral probably dural artery (orange) with fistula point (red) and draining into a radicular vein (light blue) connected to the spinal venous network (above, not shown). ANTERIOR SPINAL ARTERY (ASA): Cervical, thoracic, lumbar, and conus regions. 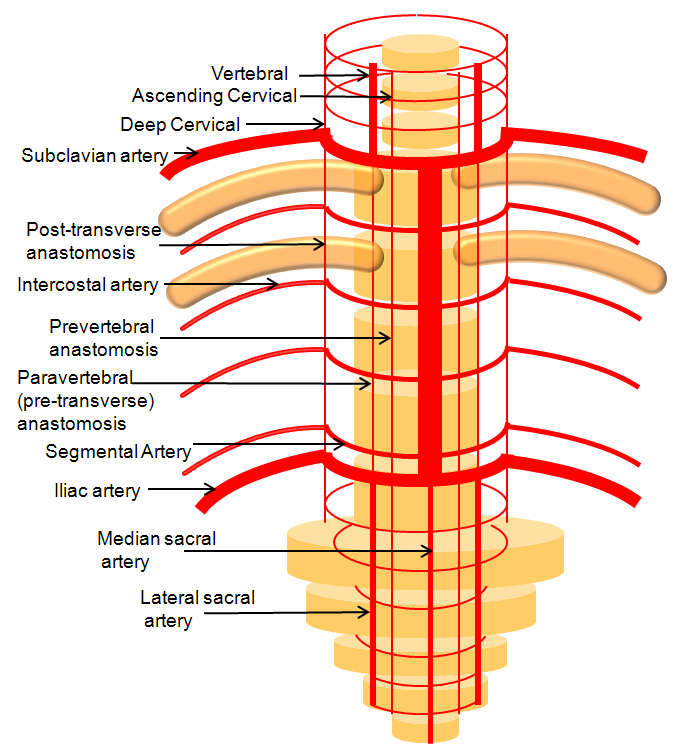 Overview: the anterior spinal artery (Q) develops as a longitudinal vessels connecting transversely oriented segmental arteries, as discussed at length above. It is located on the ventral surface of the cord, adjacent to the ventral median fissure of the spinal cord. It varies in size, more or less based on the amount of gray matter at the given segment. As such, its size is substantially larger in the cervical and lumbar segments (might be 500-750 micrometers in diameter), as compared with slender mid-thoracic size. As such, one end of the ASA has limited to no capacity to support the other should its dominant radiculomedullary supply fail. 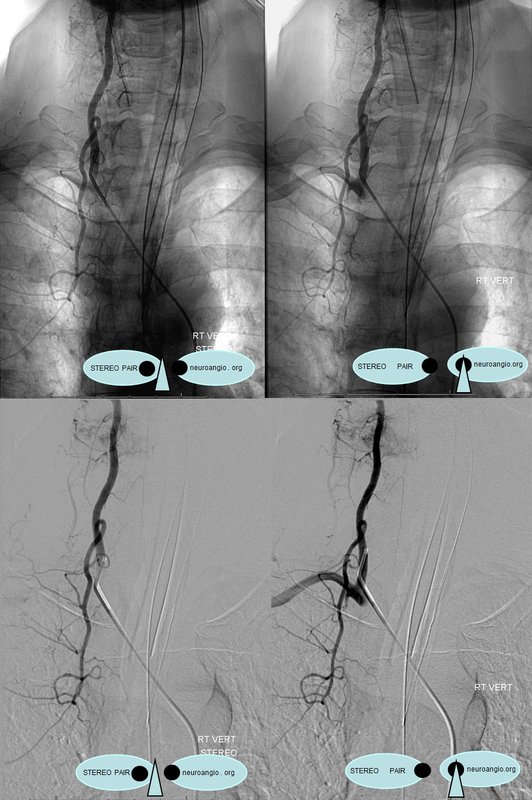 The arterial supply to the ASA consists of radiculomedullary arteries (P), which represent persistence of embyronic segmental connections between the aorta and the developing ASA. Their number varies, perhaps being 6-10 in the human. Some are quite small and, as such, below resolution of in vivo spinal angiography. The larger cervical and lumbar ASA segments are associated with larger radiculomedullary arteries to supply them — the famous artery of lumbar enlargement (Adamkiewicz), and the less well known (radiculomedullary) artery of the cervical enlargement, known to some neurovacular anatomists as the artery of Lazorthes. The Lazorthes most commonly arises from lower cervical vertebral artery, though not infrequently from deep cervical or supreme intercostal vessels also. The Adamkiewicz comes off between T9 and T12 in 75% of cases, more commonly on the left (which means, to me, that 1/4 of the time, its somewhere else). Not infrequently, there are two relatively smaller radiculomedullary arteries at the lower thoracic spine, instead of one big Adamkiewicz. 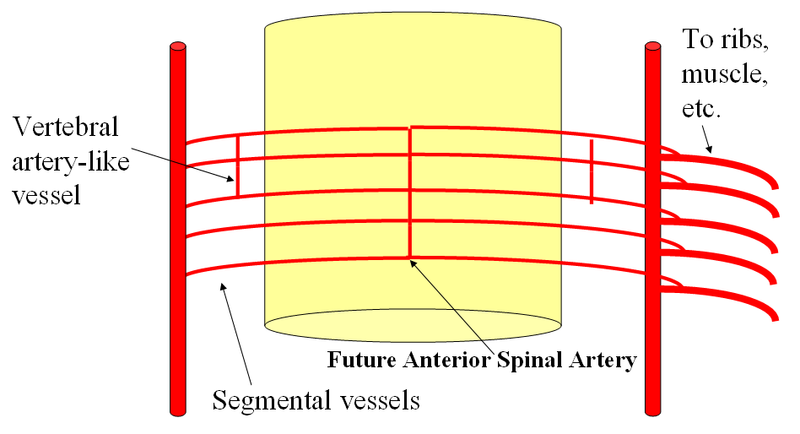 At the bottom of the cord, the anterior spinal atery is typically connected to posterior spinal arteries (T) via what paired arteries (Z) which go by many names (such as rami cruciantes), forming a kind of arterial basket (see above diagram, and below for angio images). 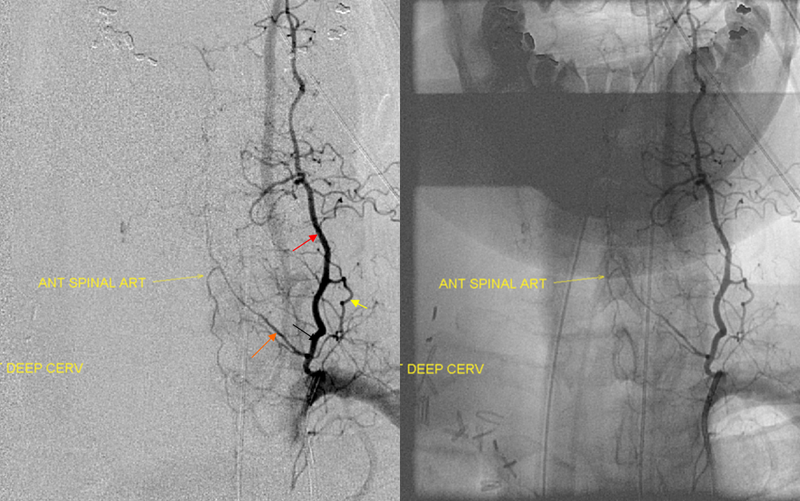 Visualization of this basket is critical if you wish to call a spinal angiogram “complete”. Bilateral vertebral artery study in anterior spinal artery supply. Sometimes, in intracranial work, it becomes important to know the location of the anterior spinal artery with respect to the cervical spine. For example, vertebral artery dissection may be treated differently depending on whether it involves ASA origin. Vertebral artery sacrifice should not be undertaken until the location of the ASA has been considered. 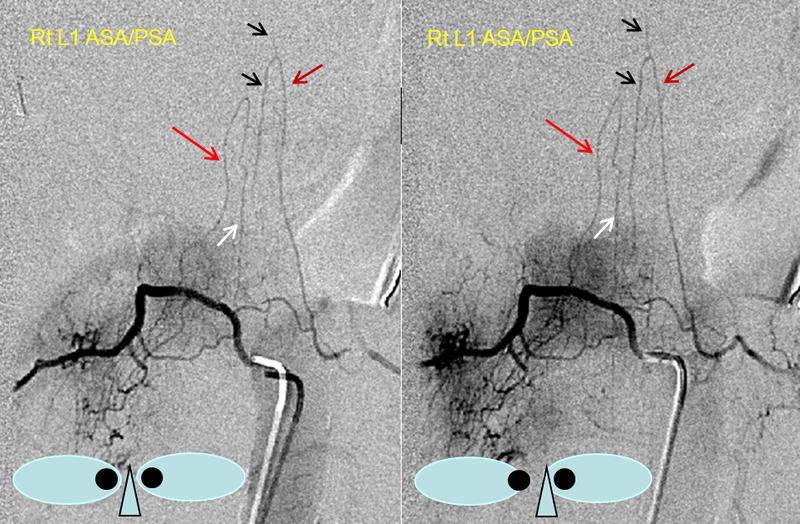 For example, closing a vert immediately distal to radiculomedullary ASA contribution, without other runoff branches, risks possibility of the vert stump thrombosing back and closing this ASA segment. Collaterals are often insufficient to maintain cord viability. 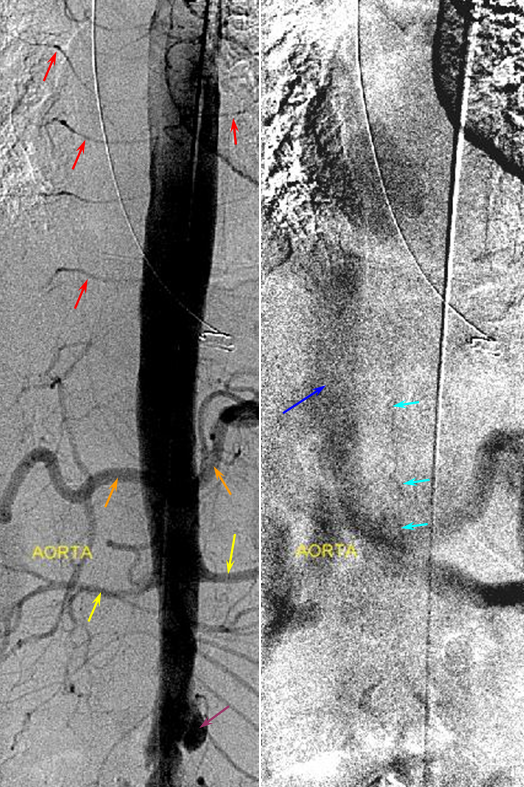 Just seeing one radiculomedullary ASA contributor may not be enough in some cases — to truly define full anatomy one must opacify the entire ASA system. 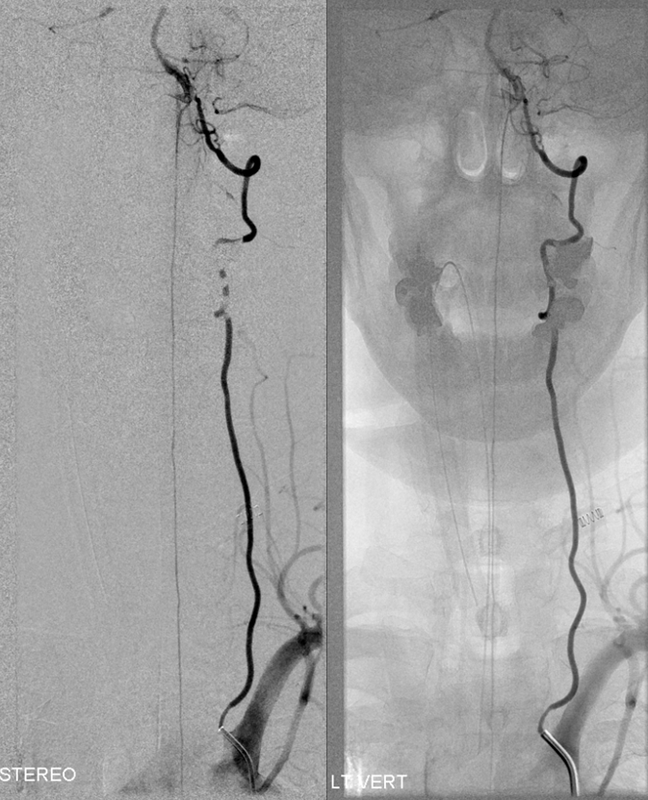 If a given radiculomedullary artery only shows the ASA inferior to its level, then one must keep looking for additional rostral sourses. 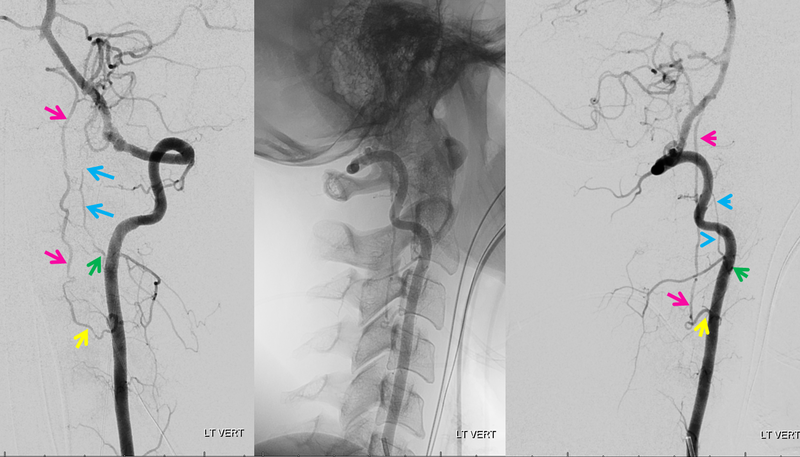 For example, if one sees an ASA from C5 down in a case where ascending or deep cervical embolization is required, it would be advisable to find the source of superior cervical supply before concluding that ASA territory is safe. In this case, the upper cervical cord segment is supplied from the left C5/6 level, while the inferior cervical cord from the right C4/5 segment. Another view of cervical radiculomedullary artery (of Lazorthes) arising from inferior vertebral (C6 segment). This kind of dominant supply is seen less frequently for the cervical spinal cord than it is for the thoracolumbar enlargement in case of the artery of Adamkiewicz. 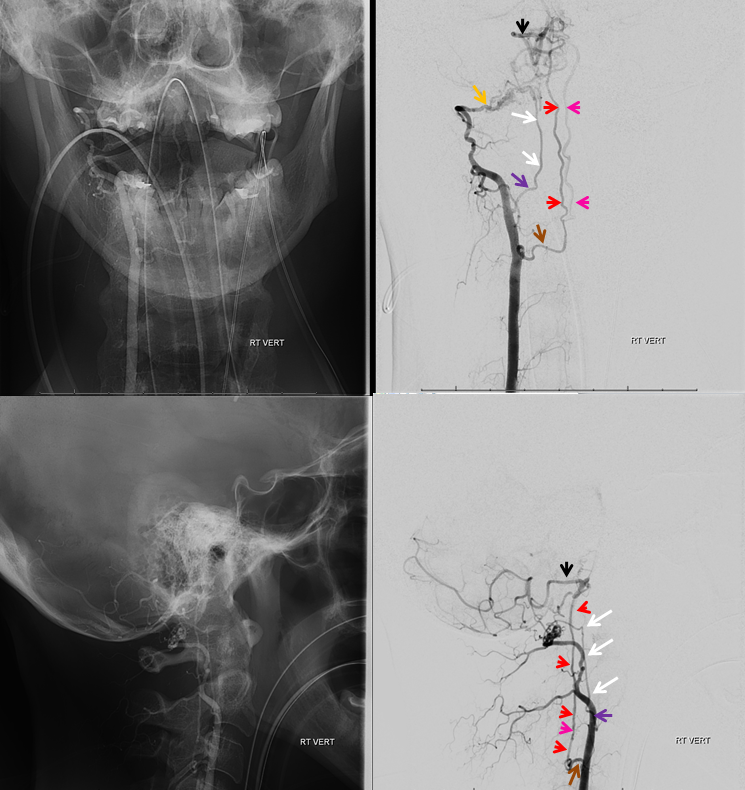 A, B – Frontal and C — lateral stereo pair projection digital subtraction and native angiographic views of right vertebral artery injection, visualizing a dominant cervical radiculomedullary artery (P, artery of Lazores) and the anterior spinal artery (Q), anastomosing with its basilar homolog (long white arrowhead). Very faint posterior spinal artery (T) is best seen in stereo, as well as the lateral spinal artery (short white arrow). Another view of the cervical cord, this one also displaying the posterior spinal (brown) axis and the pial vessels (yellow) which connect the anterior and posterior axes on the pial surface of the cord. Visualizaton of the pial network of the thoracolumbar cord is limited by the body habitus of the patient, which works against resolving small vessels even under conditions of perfect paralysis and apnea. The situation is much better in the cervical spine. Notice the discontiguous nature of the posterior spinal network, in contrast to the straight anterior spinal artery. 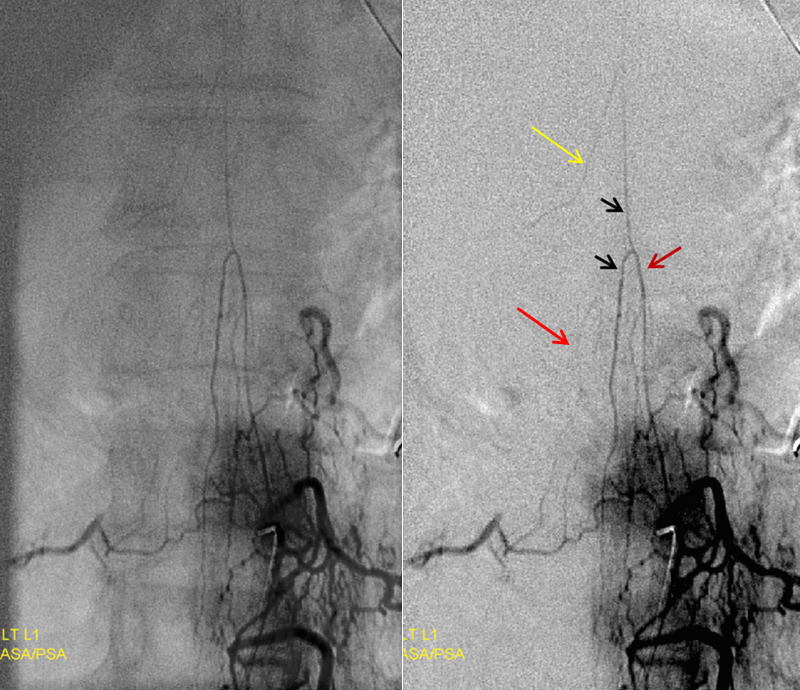 Although balanced supply to the cervical cord is more common, and most of the time it comes from the cervical vert, occasionally the typically small distal intracranial vertebral artery supply is dominant, as in this case. It is important to pay attention to this when flow diversion methods are used in the distal vertebral artery. Injection of the left vertebral artery reveals a healed, less severe superior vertebral dissection. In a mirror image fashion, the left C4 radiculomedullary artery (yellow) supplies the “left-sided” portion of the anterior spinal system (pink) which was also seen from the right vert injection. The odontoid arcade (blue) and its C3 radiculodural artery (green) are also well-seen. 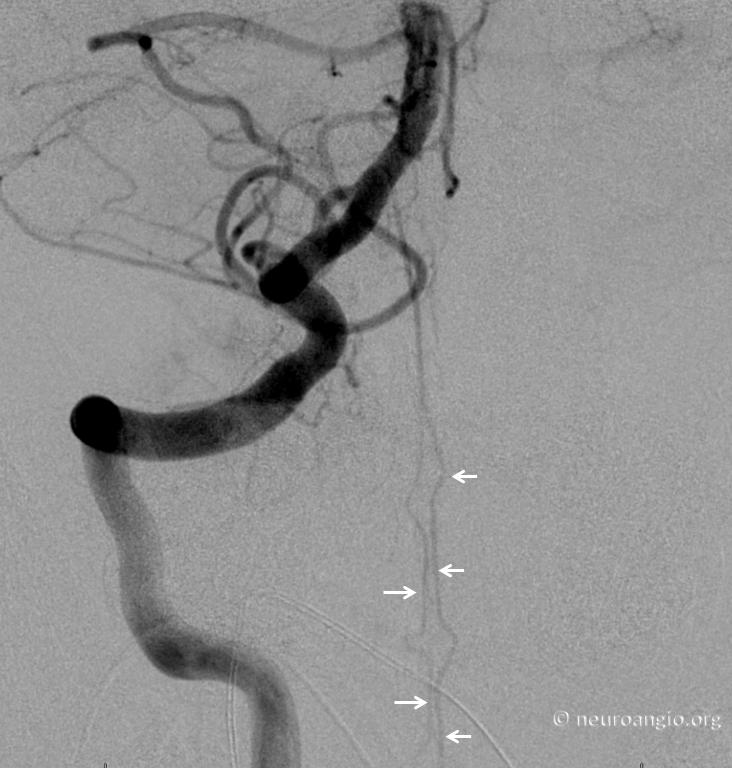 Deep Cervical origin of the radiculomedullary artery — second most common after the vert. At our institution, all cases of posterior fossa subarachnoid hemorrhage with no intracranial cause REQUIRE identification of the anterior spinal artery, as in ~10% of cases (in-house experience) the pathology turns out to be in the cervical spine. Anterior spinal artery (Q) origin from deep cervical artery, P= radiculomedullary artery; notice collateral opacification of the vertebral artery (long white arrow) via the C2 segmental artery (short white arrow). Another deep cervical origin — any longitudinal system can give origin to the radiculomedullary artery — in this case the radiculomedullar artery (orange) originates from the deep cervical branch (red). 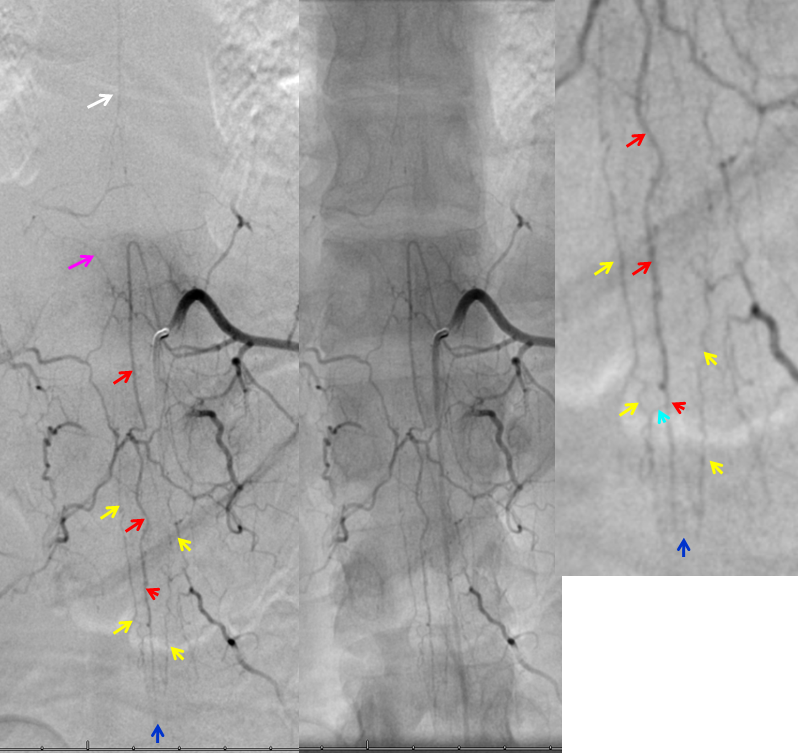 Notice also injection of supreme intercostal artery (pink, lower two images) with extensive deep servical artery anastomoses (yellow) through which the anterior spinal artery can be inadvertently embolized. The catheter, barely engaged in the supreme intercostal, is labeled in blue. Same patient, contralateral side, demonstrating tumor blush (hemangiopericytoma) from the right subclavian injection supplied by costocervical (purple) and thyrocervical (orange) branches. An ipsilateral supreme interconstal (red) injection demonstrates extensive additional tumor, which is not apparent from the subclavian injection. The vert is labeled in light blue. The artery of Adamkiewicz. Typical appearance. 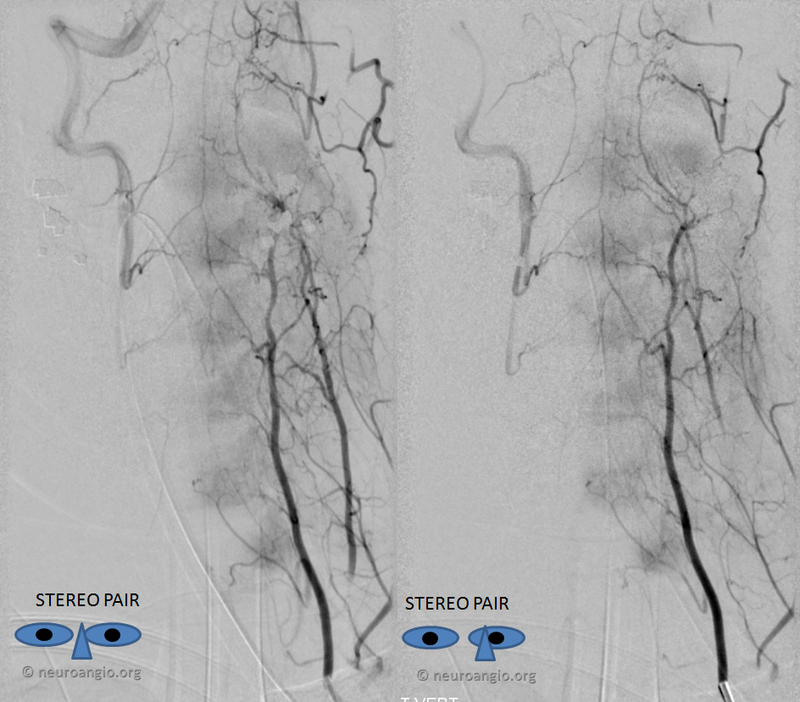 Another patient, with stereo views of the radiculomedullary artery. 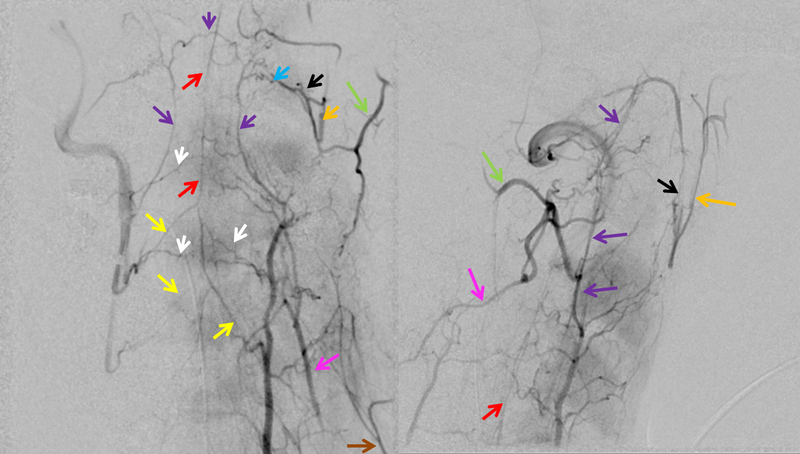 The radiculomedullary artery (pink) often demonstrates a small segment of narrowing at the point where it pierces the dura (white arrow). The intradural segment (blue) opacifies the anterior spinal artery (red). RDC (catheter) is labeled in green. Figure 9 A-D: A – early arterial, B – late arterial, C – native, and D – venous phase images. The artery of Adamkiewicz (Ka), originating at left L1 level, opacifies the anterior spinal artery (Q). 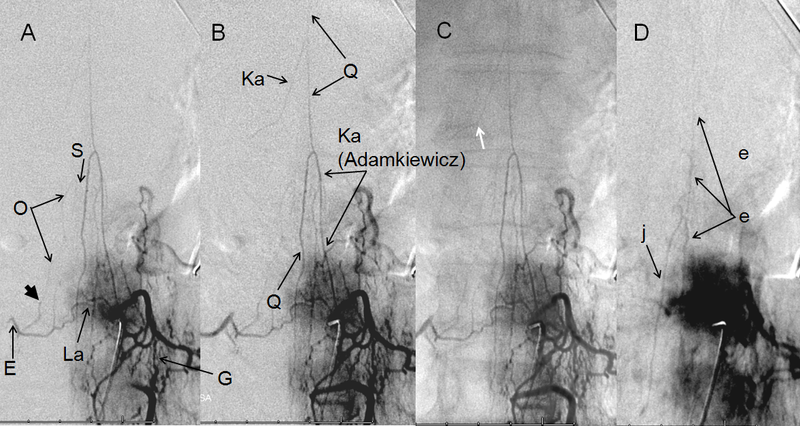 The force of contrast injection transiently reverses flow in a smaller radiculomedullary contributor (Ka) sephalad of the Adamkiewicz. 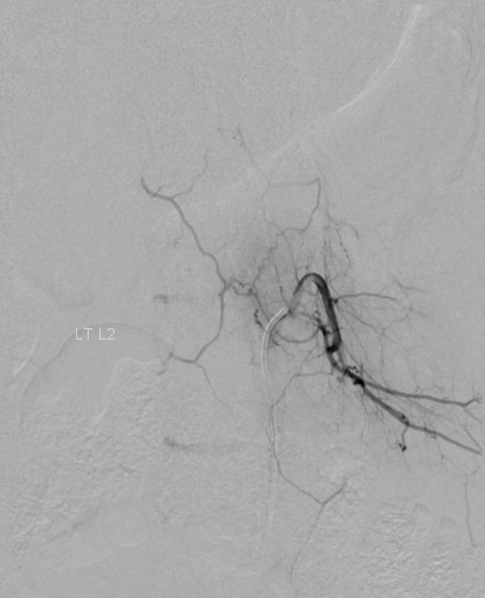 A faint radiculopial artery (O) from contralateral right L1 level is visualized through the anterior epidural arcade (La). Notice subtle caliber change where the radiculopial artery pierces the dura (short black arrow). D- venous phase image demonstrating expected visualization of spinal vein (e, either anterior or posterior), and the “Great Radicular Vein” (j), the venous homolog of the Adamkiewicz. These are some of the most gorgeous spinal images I’ve seen, courtesy of Dr. Tibor Becske. The patient presented for pre-surgical embolization of thyroid metastasis to the T8 vertebral body. Notice faint visualization of the anterior spinal artery (white) from the right T8 segmental injection. For more information on pre-procedural identification of the anterior spinal artery, see Cases 1 and 2 in Case Archives. The main contributor to the anterior spinal axis (Adamkiewicz, ) arises from the left T11 level. The tumor can still be embolized from the right T8 level as long as the Adamkiewicz can adequately reconstitute the anterior spinal axis at the level supplied by the right T8 segment. 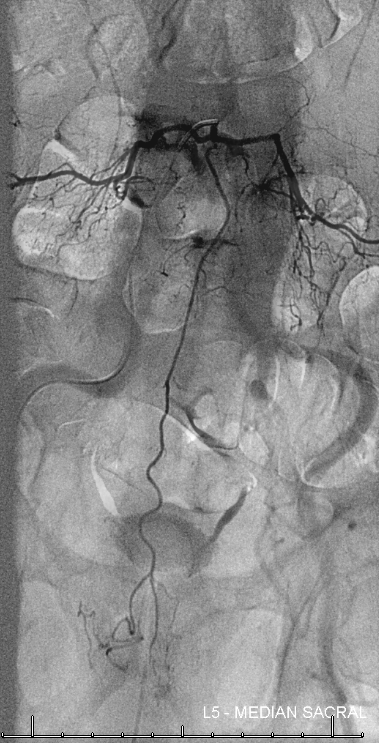 This can be determined by Balloon Test Occlusion of the right T8 radiculomedullary artery while injecting the level of the Adamkiewicz. The decision is made on angiographic basis as the patient is asleep and, in my opinion, the exam is too unreliable in the time span of the BTO. 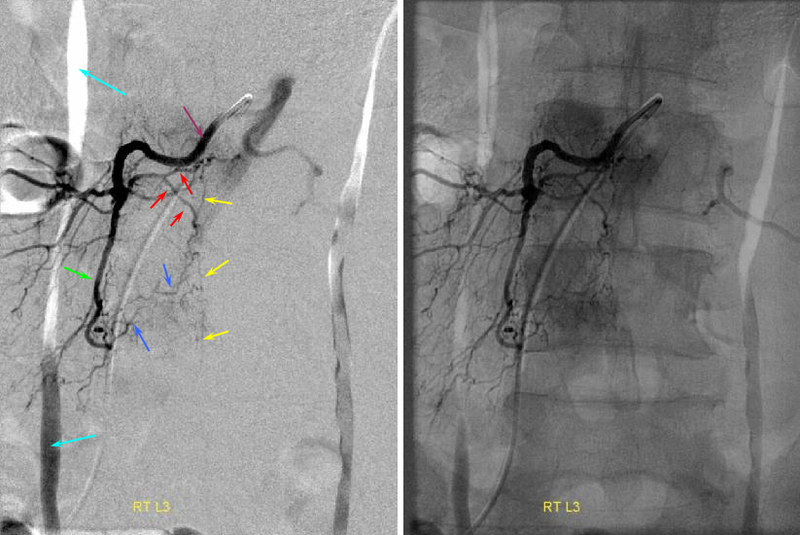 If the patient passes BTO, the right T8 radiculomedullary artery is closed (very tightly) with coils, and the tumor can then be embolized (particles). So, below is an injection of the left T11 Adamkiewicz (pink) with balloon inflated in the right T8 ventral division (black). Notice amazing visualization of the anterior spinal axis (white), with contrast reflux into the radiculomedullary arteries at the right T8 level (light blue) and left T10 levels (dark blue). Also extremely well seen are long contiguous segments of the posterior spinal artery on the right and somewhat shorter but still quite extensive for the posterior spinal system segment on the left (purple arrows), The PSAs are opacified via the well-seen vasocorona (pial) networks (green), retrogradely visualizing radiculopial contributing vessels (orange). The left T10 level supplies both anterior and posterior spinal arteries, and therefore would be technically radiculomedullopial. Variant high origin of thoracic ASA. The “Adamkiewicz” can occasionally (25% of the time) come off unusually high or low. 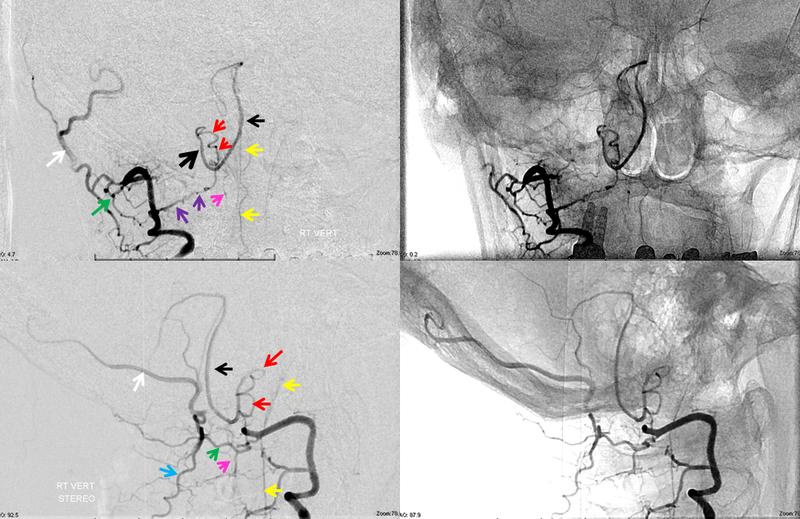 In these cases, there is often variation in terms of posterior cerebral artery anatomy as well. 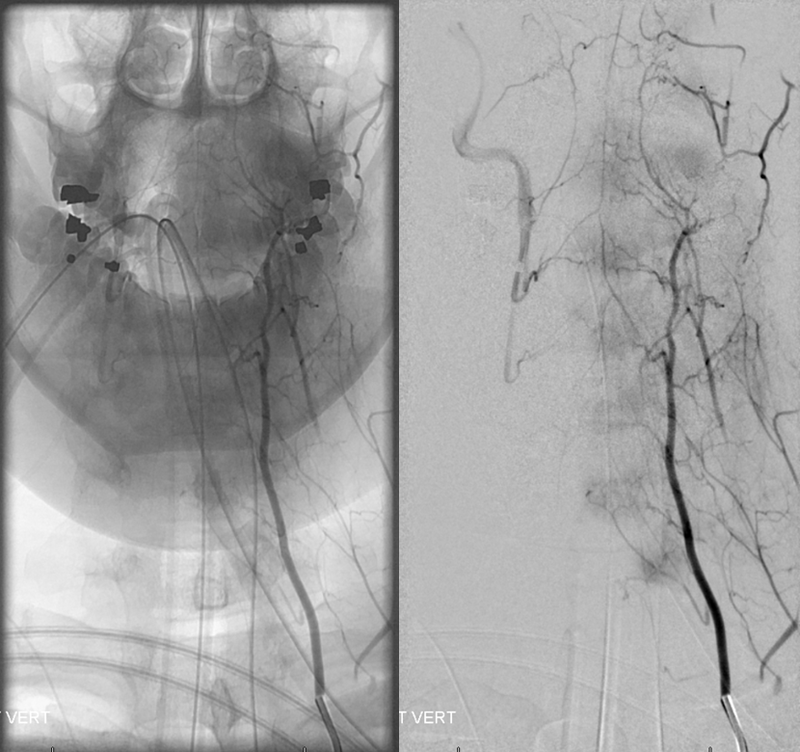 In this patient, a large Left T5 level radiculomedullary artery supplies the ASA (white) of entire thoracic spine. 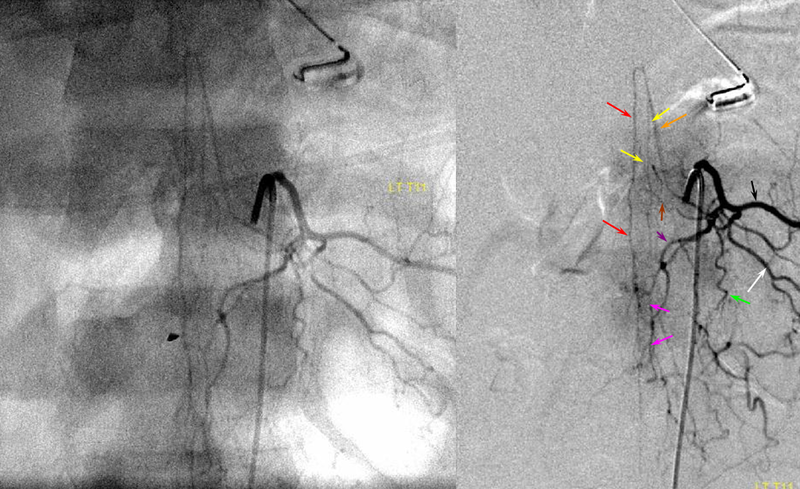 Patients like these are at a somewhat higher risk of cord infarction, having little in the way of collateral radiculomedullary ASA supply. An unusually prominent posterior spinal artery (red) is present also. Conus region — the terminal region of the cord, conus medullaris, is quite vascular. It is usually visualized as an arterial “basket”, consisting of the anterior spinal artery and two “posterior” spinal arteries, which which are anastomosed at the bottom of the conus via the rami cruciantes (blue, “Z” in figure 2). 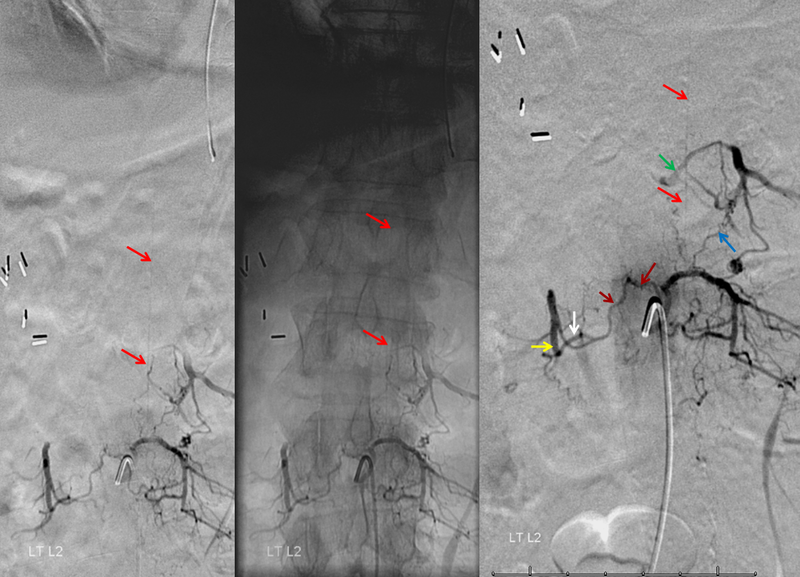 Multiple radicular arteries, supplying the nerve roots of the cauda equina, are usually opacified through the basket (unlike the rest of the cord, where radicular arteries are usually visualized via segmental arterial injections, and normally flow towards, rather than away from the cord). Because of its rich vascular supply, later phase images usually allow for visualization of spinal veins. This can be important, if an agiogram is being perfromed to locate an occult spinal dural fistula. 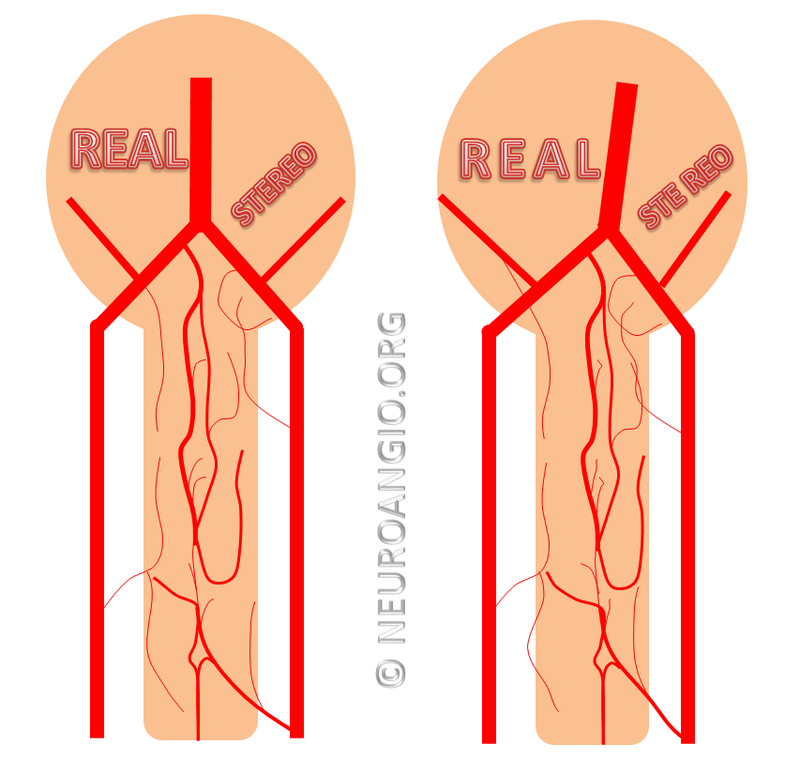 Usually, the fistula drains into spinal veins, and presents as venous congestion of the cord. Therefore, injection of spinal arteries in these patients usually does not visualize normal veins, as these are being congested by the fistula. Therefore, seeing morphologically normal veins at appropriate venous phase time (3-5 seconds following arterial phase) is good evidence that either 1) no fistula is present, or 2) it does not congest spinal veins. 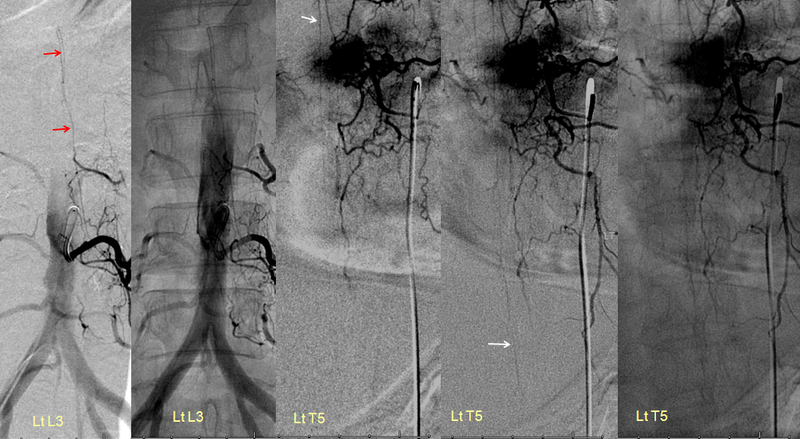 In this young patient, the conus region “arterial basket” is particularly well displayed. The anterior spinal artery (red) opacifies, via coronary arteries at the bottom of the conus (dark and light blue arrows) the lateral spinal (posterior spinal) systems (yellow arrows). Notice, in an image to the left, how a more superior segment of the anterior spinal artery (white) is visualized through the retrocorporal arcade (pink arrow). 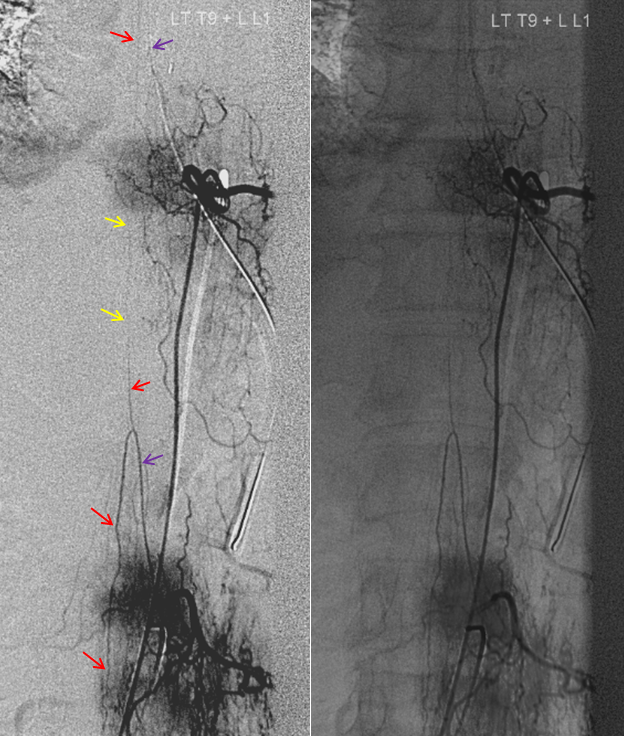 Arterial “basket” consisting of the anterior spinal artery (black) and lateral/posterior spinal arteries (white) can often be visualized from an appropriate radiculomedullary artery injection (purple for radiculomedullary and red for radiculopial). 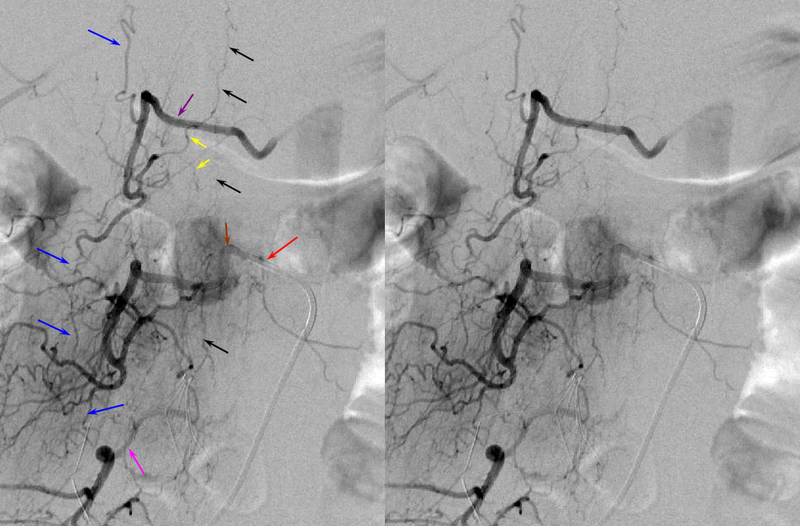 In this case, the posterior spinal network is coming from left L1, and radiculomedullary artery (purple) to the ASA from the right L1, but both can be seen secondary to cross-filling. Venous phase component of Anterior spinal artery injection — more fully treated in the Spinal Venous Anatomy page. It is crucial to note that injection of a dominant ASA should lead, under appropriate conditions of general anesthesia and paralysis, to visualization of the spinal veins, 4-8 seconds later. What is typically seen is a single spinal vein running in parallel with the anterior spinal artery, and one or several radicular veins. There is often a “great radicular vein” present, like the “great radiculomedullary artery of Adamkiewicz) but almost never at the same level as the Adamkiewicz. 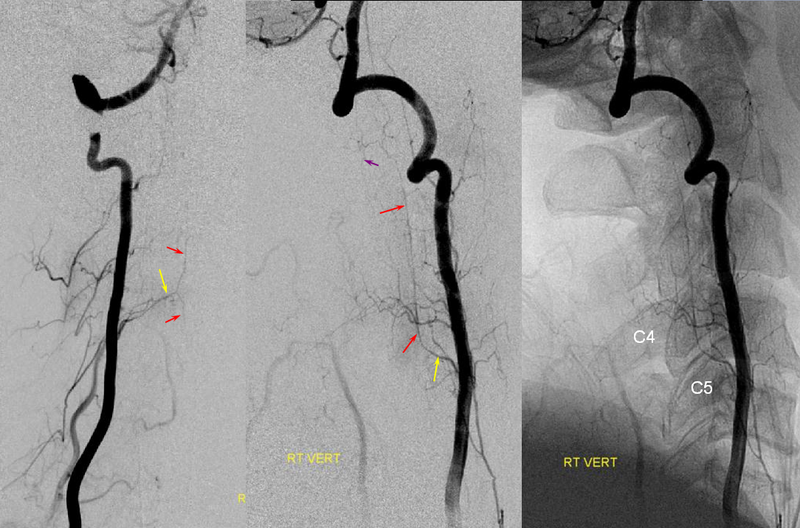 It is critically important to see spinal veins in cases where dural fistula is being suspected, because fistulas typically congest these veins to such an extent that they are not visualized on ASA injections. In other words, if you inject the ASA but dont see spinal veins, it is likely that the reason is spinal venous congestion. Below, venous phase images of the same injection demonstrate an anterior spinal vein (dark blue) and radiculomedullary vein (light blue). Posterior spinal artery (red) visualization from the Left L2 segment. 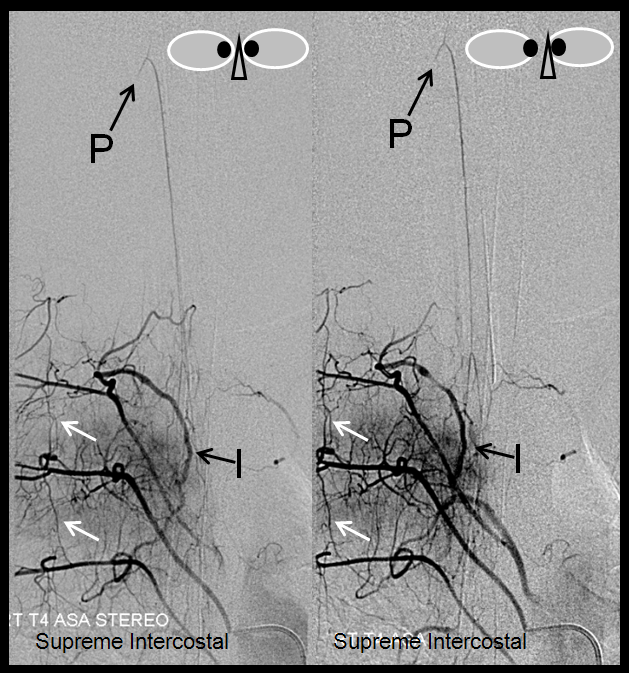 The artery is off midline as seen on the middle native AP image. Notice also opacification of the contralateral Right L2 level (yellow) via the retrocorporeal arcade (Brown) opacifying the ventral division (white); the paravertebral anastomotic network (blue) opacifies the ipsilateral left L1 level segmental vesses (green). Unusually promient PSA (red arrows, off midline) in association with high origin and poor collateral support of the artery of thoracic enlargement (white). Same case as above in the ASA section. Another demonstration of posterior spinal arterial anatomy. A — Stereo pair, and B – legend, demonstrating multiple transverse and longitudinal anastomotic connections. The pre-vertebral anastomosis, hallmarked by its proximal location relative to segmental artery ostium, is labeled “C”. Also present are pre-transverse (G) and post-transverse (I) anastomoses. 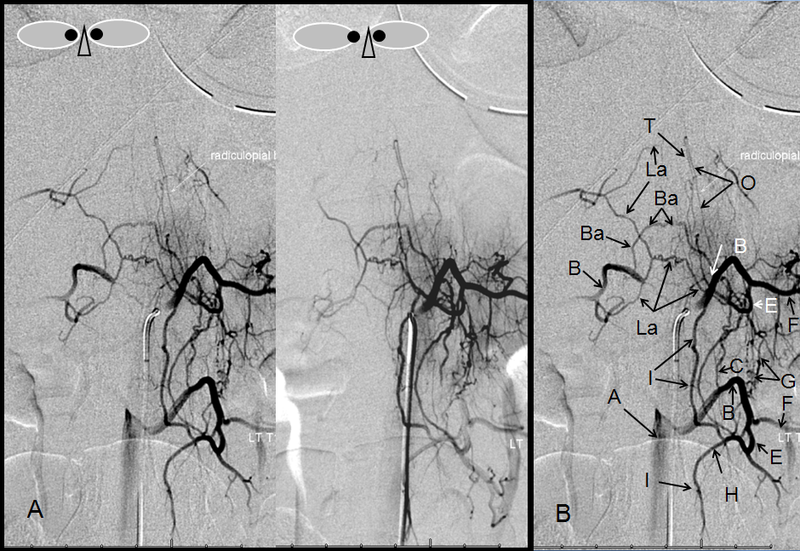 A not so commonly encountered anastomosis between two proximal segmental arteries (Ba) is present, along the anterior circumference of the vertebral body. A prominent posterior spinal artery (T) and its radiculopial feeder (O) can be seen, in an off-midline position. Radiculomedullopial artery — when both anterior (Q) and posterior (T) spinal arteries are supplied by one common radicular vessel, that’s the name. Images 1-5 in time sequence, from earliest to latest. 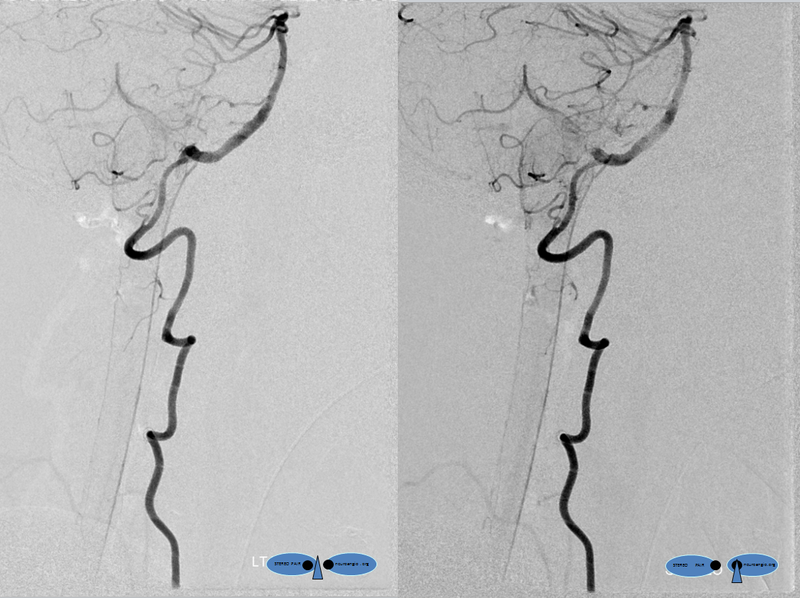 In this thin patient, the radiculomedullary artery (white) supplies the anterior spinal artery (red). Both left and right posterior spinal arteries (yellow arrows) are visualized via two “vasocorona” or pial arteries (pink, letter “V” in the diagram on top of page). These arteries run on the surface of the cord. 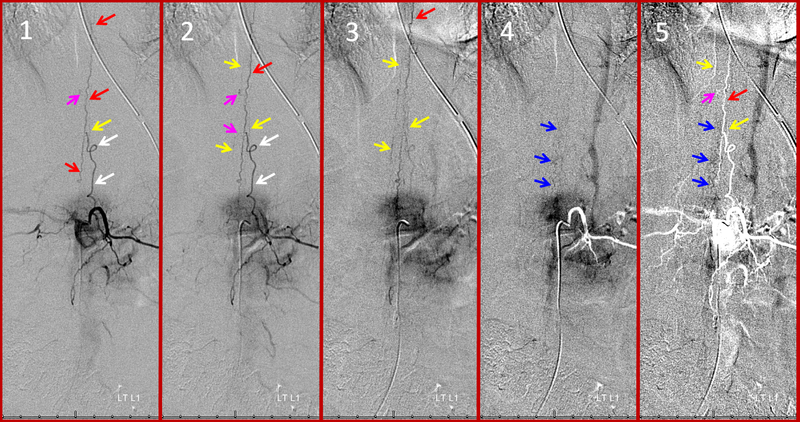 Venous phase images visualize the perimedullary spinal venous network (blue arrows, images 4 and 5). 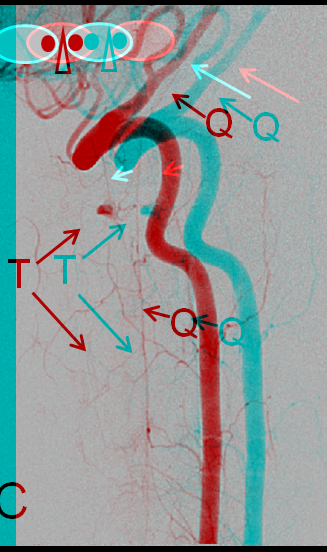 Image 5 is the same timepoint as 4, with the mask image adjusted to show the arterial phase in white. Once Again: Injection of a dominant (Adamkiewitz, in this case) radiculomedullary artery should allow, with use of modern equipment and appropriate technique (meaning general anesthesia, full paralysis, apnea during image acquisition, and glucagon-induced bowel paralysis, if necessary) visualization of the spinal veins at the appropriate time point (perhaps around 5 seconds artery to vein circulation, with variability depending on conditions). Failure to visualize spinal veins under these conditions, particularly when looking for a spinal fistula, should be taken as indirect evidence of existence of such fistula elsewhere, with secondary venous congestion. Visualizaton of the pial network of the thoracolumbar cord is limited by the body habitus of the patient, which works against resolving small vessels even under conditions of perfect paralysis and apnea. The situation is much better in the cervical spine, where pial vessels (yellow arrows) bridging the anterior spinal (red) and posterior spinal (brown) axes can be seen, as below. Notice the discontinuous nature of the posterior spinal network, in contrast to the straight anterior spinal artery. Lateral Spinal Artery — see also Vertebral Artery and PICA pages. Lateral spinal artery is a fascinating vessel — it is an artery present on the lateral aspect of the upper cervical cord and cervicomedullary junction. Lasjaunias and others consider the PICA to be a hypertrophied lateral spinal artery, recruited to supply cerebellar territory. This powerful concept explains many PICA variations — for example the C1 or C2 origin PICA is essentially a larger lateral spinal trunk ultimately connected to the intracranial PICA. This is also important in understanding the “lateral medullary syndrome” of Wallenberg and its variants — the infarct basically corresponds to the territory of the lateral spinal artery. In this patient, the right vertebral artery is occluded just below the foramen magnum due to dissection. The C1 radiculopial artery (purple) connection to the lateral spinal artery (red) allows for reconstitution of the vermian branch of the PICA (black). The lateral spinal artery below the C1 radiculopial branch is marked with the pink arrow. Notice also presence of the anterior spinal artery (yellow) perfectly contrasting its anterior and medial position to that of the spinal artery. The C1 radicular branch (purple) is in effect the radiculopial artery is acting as a radiculopial artery, homologous to radiculopial supply of the posterior spinal arteries at the thoracic and lumbar levels. The C1 muscular branch (green) opacifies the occipital artery (white) and deep cervical artery (blue). These vessels (W), typically arising from the anterior spinal artery, penetrate into the ventral median sulcus to reach the center of the cord, from where numerous centrifugal intrinsic arteries (Y) emerge to predominantly supply the gray matter of the cord. This represents the main intrinsic cord supply system. On the surface of the cord, rami perforantes (X) penetrate to a variable but short extent into the substance of hte cord. They seem to be more prominent in relation to the posterior spinal system, as the centrifugal system does not typically supply the dorsal columns. 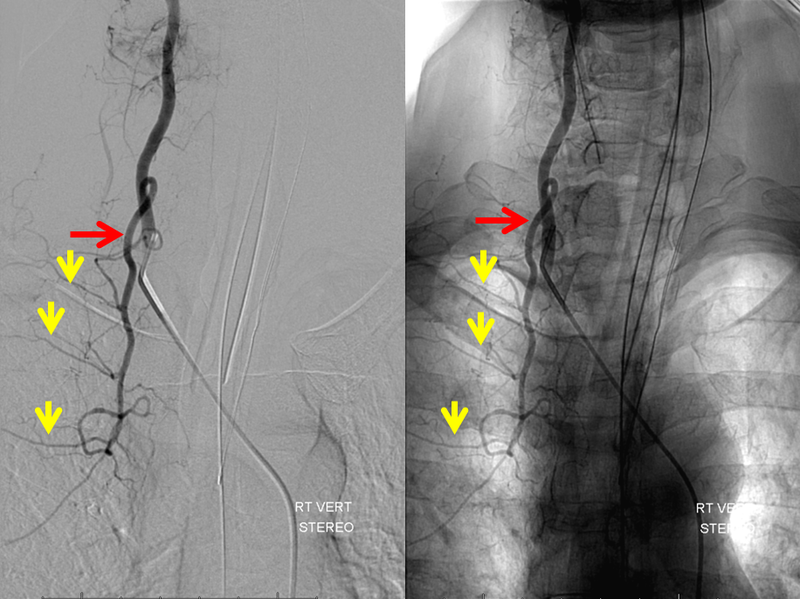 The sulco-commissural vessels (W), as all intrinsic cord vessels, are usually below the resolution of in-vivo spinal angiography; occasionally, a good injection of a dominant Adamkiewicz, in a particularly slim patient, is successful in visualizing these arteries end-on as dots, thus defining the location of the ventral median sulcus, as in the case below.